The Thomas B. Jeffery Company was an American automobile manufacturer in Kenosha, Wisconsin from 1902 until 1916. The company manufactured the Rambler and Jeffery brand motorcars. It was preceded by the Gormully & Jeffery Manufacturing Company, a bicycle manufacturer. It was the parent company to Nash Motors, thus one of the parent companies of American Motors and Chrysler. Thomas B. Jeffery was an inventor and an industrialist. He was one of America’s first entrepreneurs interested in automobiles in the late 19th century. In 1897, he built his first prototype motorcar. 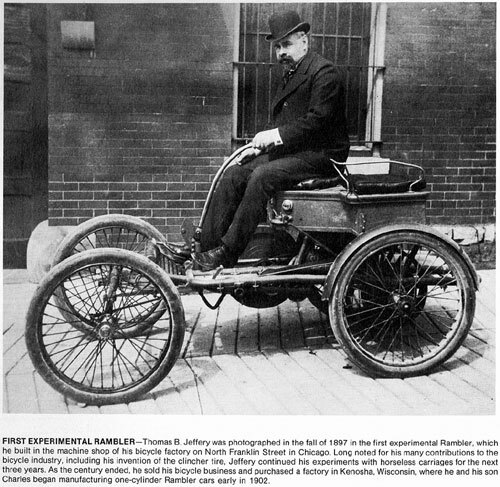 Thomas B. Jeffery was serious enough about automobiles to sell his stake in Gormully & Jeffery to the American Bicycle Company to finance the new car company. Charles T. Jeffery‘s (Thomas’ son) experimental prototypes of 1901 (Models A & B) used at least two radical innovations – steering wheels and front-mounted engines. By the time Charles was ready for production in 1902, his father had talked him out of these wild dreams and convinced him to stick with tillers and engines under the seat. 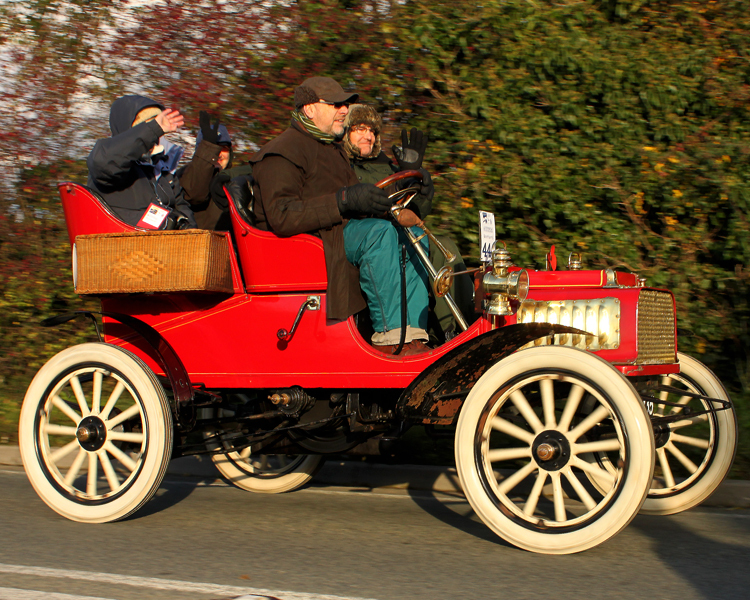 From 1902 until 1908, Jeffery moved steadily to bigger, more reliable models. 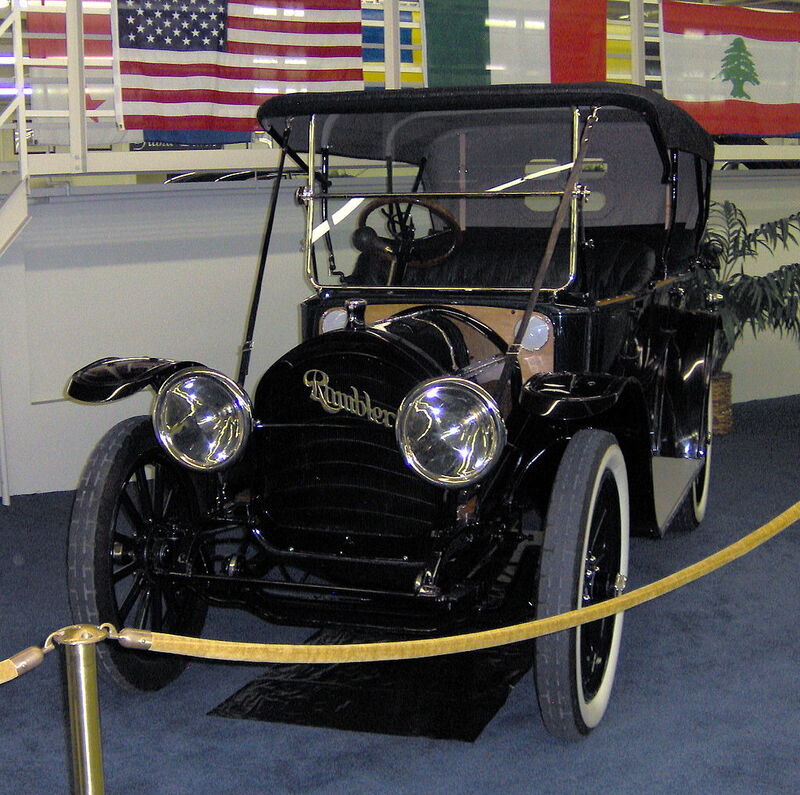 Jeffery cars were built on assembly lines (the second manufacturer to adopt them — Ransom E. Olds was first), and in 1903 Jeffery sold 1,350 Ramblers. By 1905, Jeffery more than doubled this number. One reason may have been because Charles went back to the steering wheel before 1904. In 1907, Jeffery was building a large variety of different body styles and sizes. Among them was a five-passenger, US$ 2,500 Rambler weighing 2,600 pounds (1179 kg) and powered by a 40-horsepower (30 kW) engine. In April, 1910, Thomas B. Jeffery, died in Pompeii, Italy and in June of that year the business was incorporated under the name of the Thomas B. Jeffery Company, with Charles T. Jeffery as the president and general manager, H. W. Jeffery, vice president and treasurer. In 1915, Charles T. Jeffery, changed the automotive branding from Rambler to Jeffery to honor the founder, his father, Thomas B. Jeffery. As of 1916, G. H. Eddy replaced H.W. Jeffery as the treasurer so H.W. Jeffery could focus on the position of vice president. G. W. Greiner was the secretary, L. H. Bill the general manager, J. W. DeCou the factory manager, and Al Recke was the sales manager. Charles T. Jeffery survived the sinking of the RMS Lusitania (a British luxury liner torpedoed by the Germans in World War I) in 1915 and decided to spend the rest of his life in a more enjoyable manner. Charles W. Nash resigned from General Motors, saw an opportunity and bought the Thomas B. Jeffery Company in August 1916. Jeffery, with the money from his sale of Gormully & Jeffery, bought the old Sterling Bicycle Company’s factory in Kenosha, Wisconsin. The original factory building was only 600 x 100 feet (183 x 30 m) in size. 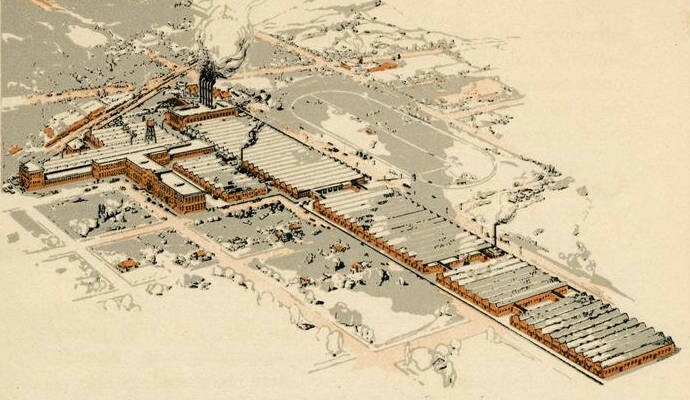 However, by 1916, the company’s buildings expanded over 20 acres (8 ha) under roof and the facilities had grown to over 100 acres (40 ha) including a test track. The Jeffrey Quad, also known as the Nash Quad or Quad is a four-wheel drive truck that was developed and built in Kenosha from 1913, and after 1916, by Nash Motors, as well as under license by other truck makers.. The Quad introduced numerous engineering innovations. Its design and durability proved effective in traversing the muddy, rough, and unpaved roads of the times. 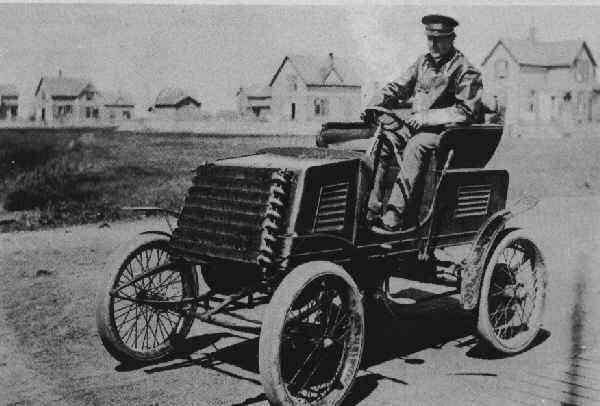 The Quad also became one of the effective work vehicles in World War I. The Quad was also one of the first successful four-wheel drive vehicles ever to be made, and its production continued unchanged through 1928, or 15 years, with a total of 41,674 units made. 1897 – Jeffery builds a rear-engine Rambler prototype using the Rambler name previously used on a highly successful line of bicycles made by Gormully & Jeffery. 1899 – Positive reviews at the 1899 Chicago International Exhibition & Tournament and the first National Automobile Show in New York City prompt the Jefferys to enter the automobile business. 1900 (Dec 6) – Thomas B. Jeffery finalizes a US$65,000 deal to buy the Kenosha, Wisconsin, factory of the defunct Sterling Bicycle with money from the sale of his interest in Gormully & Jeffery. 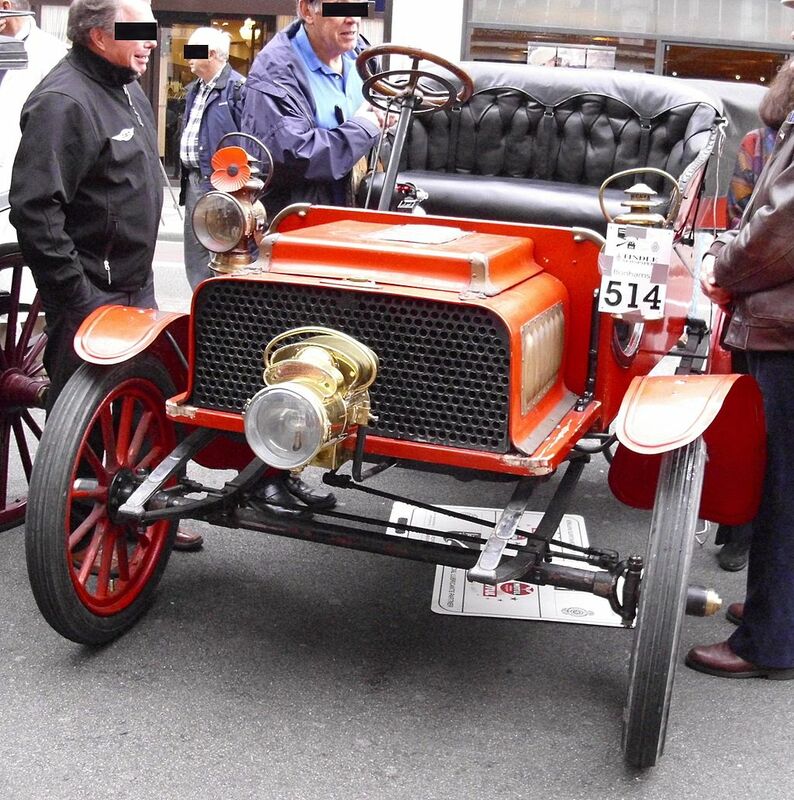 1901 – Two more prototypes, Models A and B, are made. 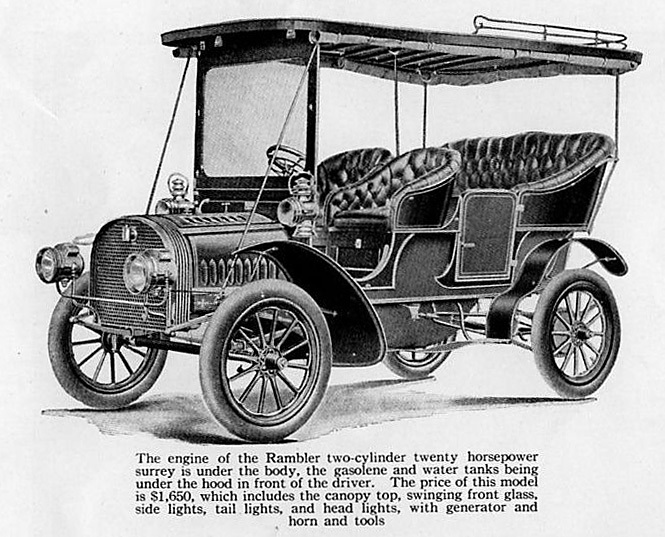 1902 – First production Ramblers – the US$ 750 Model C open runabout and the $850 Model D (the same car with a folding top). Both are powered by an 8-horsepower (6 kW; 8 PS), 98-cubic-inch (1.6 L) one-cylinder engine mounted beneath the seat, and are steered by a right-side tiller. First-year production totals 1,500 units making Jeffery the second-largest car maker behind Oldsmobile. 1910 (Mar 21) – Thomas B. Jeffery dies while on vacation in Italy. 1910 (Jun 10) – Charles incorporates the firm as a $3 million (US$75,932,143 in 2015 dollars) public stock company. 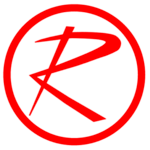 1914 – The Rambler name is replaced with the Jeffery moniker in honor of the founder. 1916 (Aug) – Charles Jeffery sells the company to former General Motors Corp. President Charles W. Nash. 1917 – Charles Nash renames the Jeffery Motor Company, Nash Motors after himself. between 1900 and 1914, then by its successor, Nash Motors from 1950 to 1954, and finally by Nash’s successor, American Motors Corporation from 1954 to 1969. It was often nicknamed the “Kenosha Cadillac” after its place of manufacture. In 1914, Charles T. Jeffery, Thomas B. Jeffery’s son, replaced the Rambler brand name with Jeffery in honor of his now deceased father. Under the direction of Charles Nash’s successor George W. Mason, Nash-Kelvinator Corporation began development of a small car that could be produced inexpensively for the post World War II economy. However, steel shortages limited the amount of raw materials that Nash could get, so Mason turned the compact, now designated the Rambler, into a two-door sedan with a convertible top and the cars were equipped with many standard features that were typically options, to maximize profits for the company. When introduced, the Rambler was an immediate success for Nash. 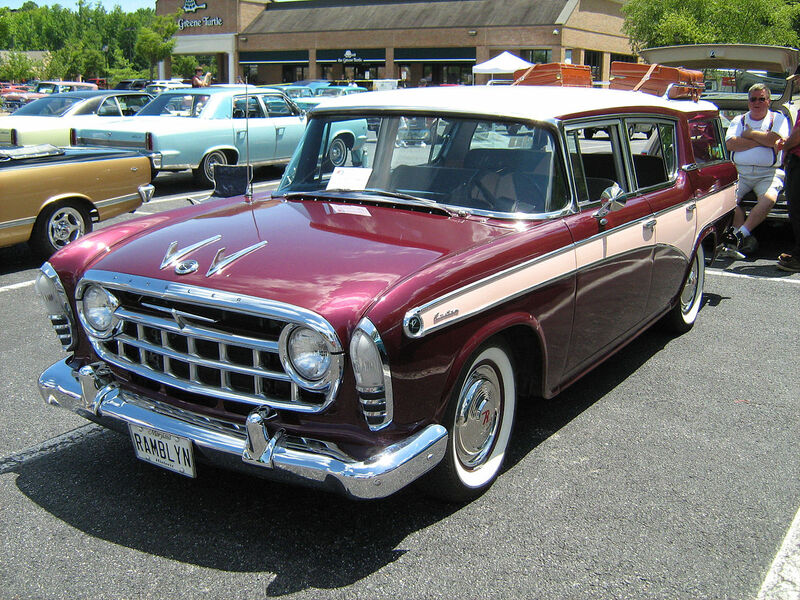 As steel quotas (related to the Korean War) eased, the Rambler line was broadened in both its model types (first a station wagon and 2-door hardtop dubbed “Country Club”, and later a 2-door sedan. A further expansion of the line for 1954 included a four-door sedan and station wagon called “Cross Country”) on a stretched wheelbase, which proved to be as successful as the first generation of two-door sedan convertibles. 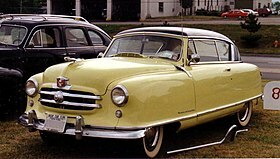 The first generation of modern Ramblers carried a modified version of Nash’s Airflyte styling, which included closed wheel openings. Where the wheel openings of any car are a major source of wind resistance, the design was rather primarily an engineering design to increase the strength of the car for impact resistance. Many people surmised that the skirted fenders limited the turning radius of the wheels but was not an actual handicap for having a comparatively narrow front track. Ramblers continued to use this styling until 1955, when the front wheels were revealed by a periodic design update. In 1954 the Rambler offered the first industry combination heating and air conditioning unit that could be an add-on or installed at the factory for $395.00, which at that time was about the lowest cost unit available in an American car. In 1954, American Motors Corporation (AMC) was formed from the merger of Nash-Kelvinator and the Hudson Motor Car Company. Following the merger, 1955 and 1956 Ramblers were badged as both Nashes and Hudsons, with no visible difference between the two. 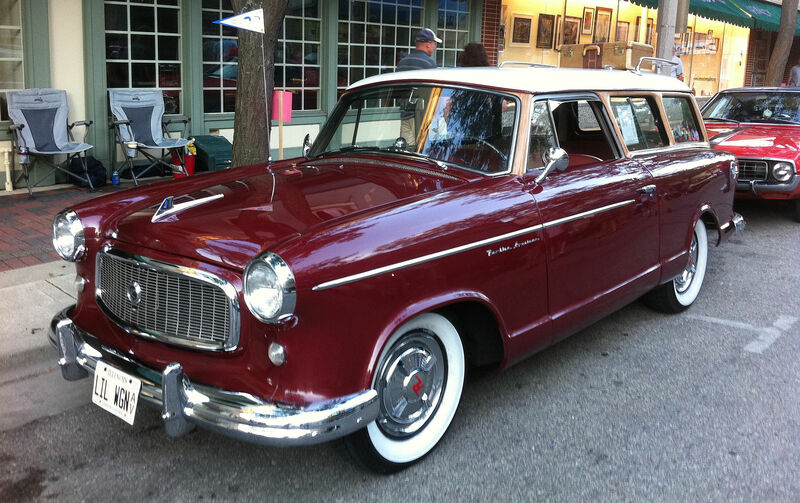 Rambler became a marque in its own right for the 1957 model year. The Nash and Hudson makes were continued as senior model only through 1957, after which all of AMC’s offerings were marketed as Ramblers, with the exception of the imported 1958-1962 Metropolitan. 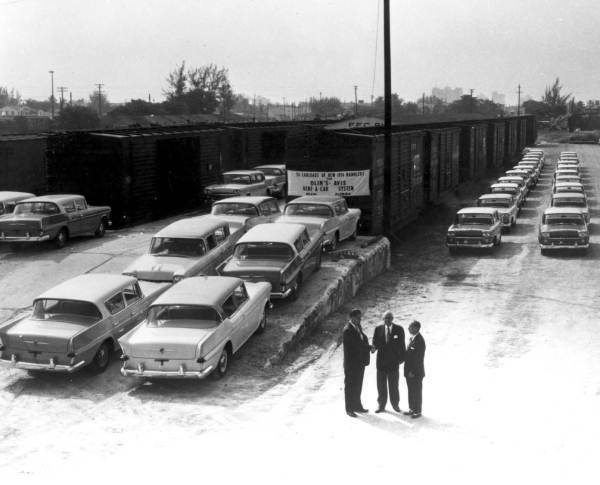 Train unloading 1958 Ramblers for a car rental company in Florida. At the start of the 1960s George Romney made a marketing decision that more fully unified the various Rambler model names under the Rambler brand. In 1962, the Ambassador, a top-trim level model, was officially brought under the Rambler name (it had previously been named the “Ambassador by Rambler”), and the former Rambler Six and Rambler Rebel V8 were renamed the Rambler Classic. (Note: while the top-line models for 1958-1961 were advertised as the “Ambassador V-8 by Rambler”, on the cars themselves, the nomenclature was “Rambler Ambassador”.) 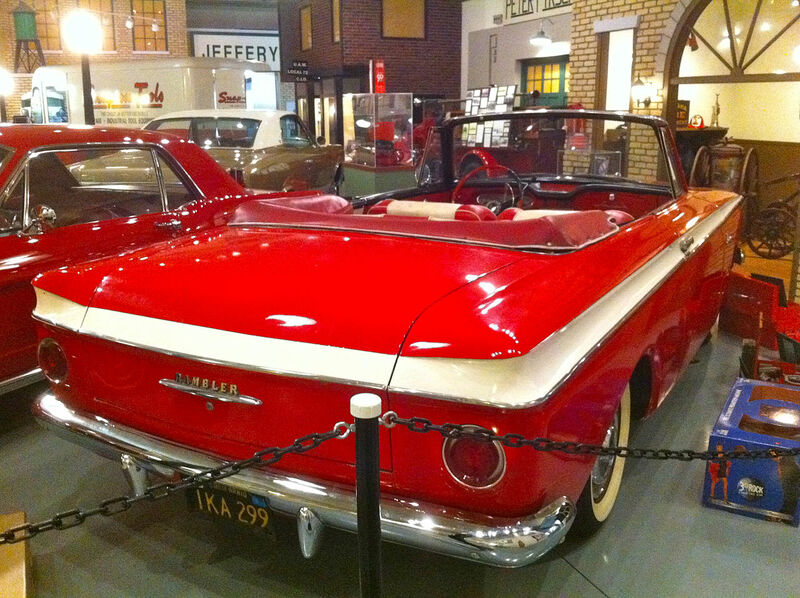 Back in 1958, AMC introduced America’s first “compact car,” the Rambler American. This car was essentially the 1950 Nash Rambler, slightly restyled and modernized for the late 1950s. However the car was an instant success and lost sales only after the “Big Three” (GM, Ford, and Chrysler) each introduced compact cars of their own. Romney also put into play his plan to slash production costs, which involved more common parts sharing between the Ambassador and Classic models. Beginning in 1962, all “senior” Rambler models would share the same automobile platform with identical wheelbase and body parts, but the engines, trims, and equipment levels distinguished the Classic from the Ambassador. The Rambler’s compact size (by US standards) also made it an international competitor, and between 1961 and 1965 AMC opened thirteen foreign assembly plants, from Costa Rica to the Philippines. In 1963, the entire Rambler line received the Motor Trend Car of the Year award. However, Romney’s departure to become Michigan governor opened the door for his successor, Roy Abernethy, to redirect the company towards a strategy of competing head to head with the Big Three (General Motors, Chrysler Corporation, and Ford Motor Company) with a variety of bodies and automobile platforms. This new plan also included marketing the various models apart from the Rambler brand name, which Abernethy felt would be a hindrance in the market segments he hoped to pursue. One of the first moves in that direction was the creation of the 1965 line of Ramblers, which split the Classic from the Ambassador visually, while still sharing a significant number of parts. Once again the Ambassador had a unique, extended wheelbase. In addition, AMC introduced the Marlin, a hardtop coupe intended to give AMC a toe-hold in the sporty fastback market while also functioning as a “halo” vehicle. AMC chief stylist Richard Teague introduced a totally restyled and attractive Rambler American in 1964, which was a sales success. This basic body remained in its original shape through 1969. Backed by marketing reports, Abernethy next made a persuasive argument to the AMC board that the Rambler name had not only acquired a stodgy image and was a hindrance to increasing sales, but that consumers associated it with compact cars. In what hindsight would show to be an ill-conceived decision, American Motors began to phase it out in favor of an AMC marque beginning in 1966, as it attempted to become a multiplatform automobile manufacturer. Retention of the well-known Rambler brand name and its association with compact economy models could have served AMC well in the 1970s. By 1968, the only vehicle produced by AMC to carry the Rambler marque, was the compact Rambler American. Although designed as a no-nonsense economy car, the American spawned the audacious SC/Ramblerdeveloped with Hurst Performance. While AMC planned to produce only 500 for the 1969 model year, the “Scrambler” proved so popular two more groups of about 500 each were built. All featured the same 390 cu in (6.4 l) V8, four-barrel carburetor, and close-ratio four-speed transmission of the AMX, plus Hurst shifter, Twin-Grip (limited slip) differential, and cold air hood. For the final year in 1969 the models were simply called Rambler. The 1969 Rambler (and Chevrolet Corvair and Dodge Dart) were the only U.S. compact cars available that year in a two-door hardtop body style; Ford compacts were only available as sedans. 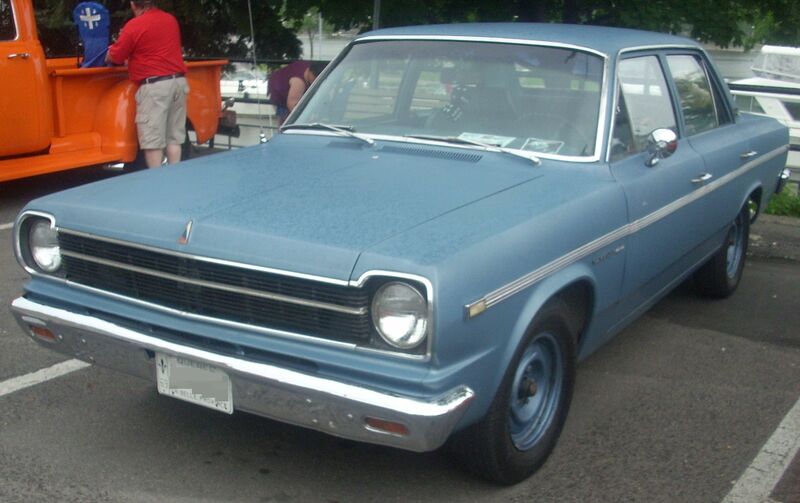 The last U.S. built Rambler was produced on 30 June 1969, and it was one of over 4.2 million cars to carry the Rambler name that rolled off the assembly line in Kenosha. The Rambler marque was continued in numerous international markets. Examples include contemporary versions of the AMC Hornet, AMC Javelin and AMC Matador assembled in Australia by Australian Motor Industries(AMI) from complete knock down (CKD) kits which continued to be badged as Ramblers until 1978. The Rambler nameplate was last used on automobiles in 1983 by Vehículos Automotores Mexicanos (VAM) in Mexico. In Argentina, Rambler passenger cars were assembled by Industrias Kaiser Argentina (IKA) commencing 1962. A special model based on the third generation Rambler American became the IKA Torino in 1967. It later was named the Renault Torino and was offered until 1980. 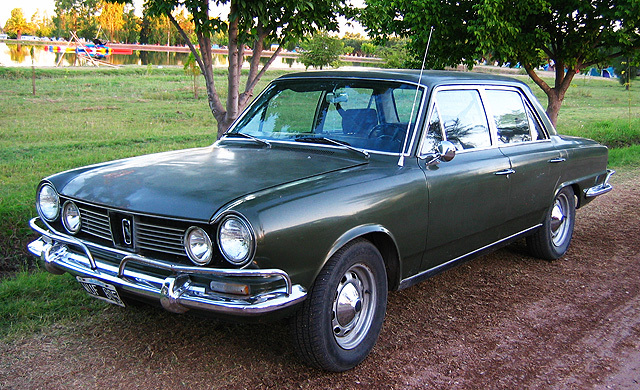 However, U.S. Rambler Classic and Ambassador models were also assembled in Argentina through 1972. The Nash Rambler is a North American automobile that was produced by the Nash Motors division of Nash-Kelvinator Corporation from 1950 to 1954. On May 1, 1954, Nash-Kelvinator merged with the Hudson Motor Car Company to form American Motors Corporation (AMC). The Nash Rambler was then built by AMC in Kenosha, Wisconsin through 1955. The Nash Rambler established a new segment in the automobile market and is widely acknowledged to be the first successful modern American compact car. 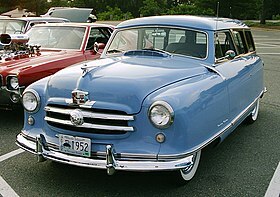 The 1950-1955 Nash Rambler was the first model run for this automobile platform. Using the same tooling, AMC reintroduced an almost identical “new” 1958 Rambler American for a second model run. This was a rare feat of having two distinct and successful model runs, an almost unheard of phenomenon in automobile history. Nash-Kelvinator’s President George W. Mason saw that the company needed to compete more effectively and insisted a new car had to be different from the existing models in the market offered by the “Big Three” U.S. automakers. The Rambler was designed to be smaller than contemporary cars, yet still accommodate five passengers comfortably. Nash engineers had originally penned the styling during World War II. The new model was the company’s entry in the lower-price segment dominated by models from Chevrolet, Ford, and Plymouth (automobile). The Rambler was designed to be lighter and have smaller dimensions than the other popular cars. A strategy of efficiency, Nash could save on materials in its production while owners would have better fuel economy compared to the other cars of the era. The Nash Rambler rode on a 100 in (2,540 mm) wheelbase, and power came from Nash’s proven 173 cu in (2.8 L) L-head (flathead)Straight-6 cylinder engine that produced 82 hp (61 kW; 83 PS). Following the design of the larger “senior” Nash models, the compact Rambler’s styling was rounded in form and also had an envelope body with fender skirts that also enclosed the front wheels. This design feature did not impair the car’s cornering ability significantly. The compact Rambler line was designed with several body styles, but the inaugural year was limited to a single model: a fully equipped 2-door convertible. The decision to bring the new car out first in a higher market segment with more standard features was a calculated risk by Mason. Foremost in this strategy was the need to give the new Rambler a positive public image. Mason knew the car would fail if seen by the public as a “cheap little car”. This was confirmed in small car comparisons in the media that described the “well-equipped and stylish, the little Rambler is economical and easy to drive” with no “stripped-down” versions, but in only high end convertible, station wagon, or hardtop (no “B-pillar”) body styles. He knew what Crosley was just finding out with its line of mini cars, and what the Henry J would teach Kaiser Motors; namely, that Americans would rather buy a nice used car than a new car that is perceived as inferior or substandard. Unlike almost all traditional convertibles of the era that used frame-free side windows, the Rambler retained the fixed roof structure above the car’s doors and rear-side window frames. This metal structure served as the side guides or rails for the retractable waterproof canvas top. This design allowed Nash to utilize its monocoque (unibody) construction on its new compact. It made the Rambler body very rigid for an open-top car, without the additional bracing required in other convertible models. The convertible top was cable-driven and electrically operated. In developing this new car, Nash had originally planned to call it the Diplomat. This name would have rounded out the Nash family of cars; as for 1950, the 600 line was renamed the Statesman, and the Ambassador remained the flagship line. When it was learned that Dodge had already reserved the Diplomat name for a planned two-door hardtop body style, Nash delved into its own past, and resurrected the Rambler name from an 1897 prototype and its first production model, in 1902. Rambler was also one of the popular early American automobile brands. 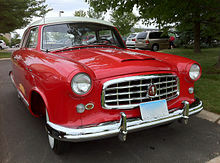 Additional historical context of the Nash Rambler, along with the Nash-Healey and the Metropolitan, was that U.S. citizens were exposed to and gained experience with the smaller, more efficient compact and sporty European cars during the Second World War. Along with the styling cues of European designs, the car’s input included the approach of more compact cars, which came from Nash-Kelvinator having a wide market overseas. This influence is seen directly in the Pininfarina designed models. AMC would later continue to import European design and styling flair for its products, such as the Hornet Sportabouts by Gucci, the Javelins by Pierre Cardin, and the Matador coupes by Oleg Cassini. The Nash Rambler was introduced on April 13, 1950; in the middle of the model year. 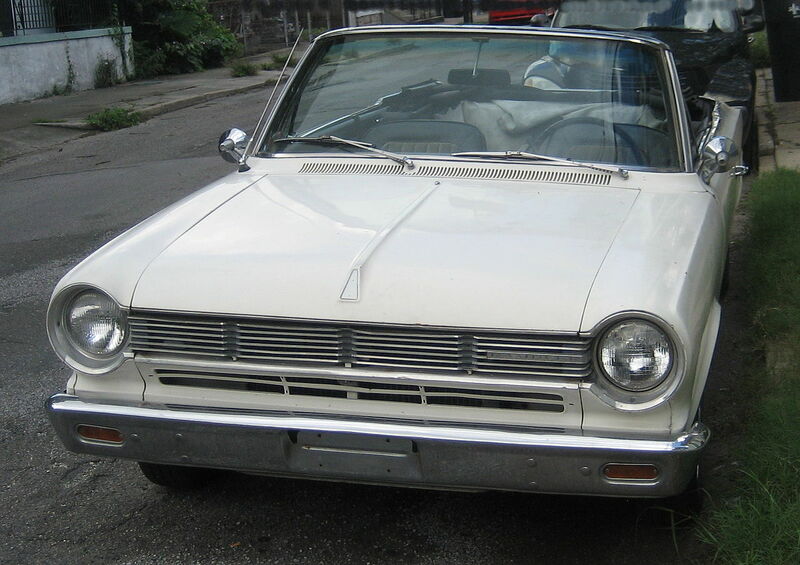 The new Rambler was available only as an upmarket two-door convertible — designated the “Landau“. Without the weight of a roof, and with a low wind resistance body design for the time, the inline 6-cylinder engine could deliver solid performance and deliver fuel economy up to 30 mpg-US (7.8 L/100 km; 36 mpg-imp). Several factors were incorporated into the compact Nash Rambler’s marketing mix that including making the most from the limited steel supplies during the Korean War, as well as the automaker selecting a strategyfor profit maximization from the new Rambler line. The new Nash Rambler came only in a convertible body, a style that had a higher price in the marketplace and incorporating more standard features that make the open top models suitable more for leisure-type use than ordinary transportation. With a base price of $1,808 (equivalent to approximately $17,722 in today’s funds), the Nash Rambler was priced slightly lower than the base convertible models convertibles from its intended competition. To further increase the value to buyers, the Nash Rambler was well equipped compared to the competition and included numerous items as standard equipment such as whitewall tires, full wheel covers, electric clock, and even a pushbutton AM radio that were available at extra cost on all other cars at that time. In summary, “it was a smartly styled small car. People also liked its low price and the money-saving economy of its peppy 6-cylinder engine.” The abbreviated first year of production saw sales of 9,330 Nash Rambler convertibles. In 1951, the Nash Rambler line was enlarged to include a two-door station wagon and a two-door pillarless hardtop — designated the Country Club. Both the hardtop and convertible models included additional safety features. Two levels of trim were available: Custom and Super. A car tested by the British magazine The Motor in 1951 had a top speed of 80.9 mph (130 km/h) and could accelerate from 0–60 mph (0–97 km/h) in 21.0 seconds. Fuel consumption of 25.2 mpg-imp (11.2 L/100 km; 21.0 mpg-US) was recorded. The test car cost $1,808 in the U.S., but British sales had not at the time started. There were no major changes for the 1952 model year. Models included a new Deliveryman 2-door utility wagon for $1,892. The “Custom” models featured Nash’s Weather Eye conditioning system and an AM radio as standard equipment. The new Greenbrier station wagons received upgraded trim with two-tone painted exteriors and they were priced at $2,119, the same as the Custom Landau Convertible model. The 1950-1952 Nash Ramblers “gained instant popularity with buyers who liked its looks, as well as loyalty among customers who appreciated its quality engineering and performance.” A total of 53,000 Nash Ramblers were made for the year. The standard engines were increased with manual transmission cars receiving a 184 cu in (3.0 L) I6 producing 85 hp (63 kW; 86 PS), while a 90 hp (67 kW; 91 PS) 195.6 cu in (3.2 L) I6 powered cars with the optional “Hydra-Matic” automatic supplied by General Motors. 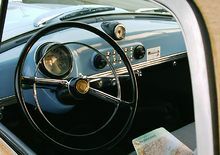 The Custom models added Nash’s “Weather Eye” heating and ventilation system, as well as a radio as standard equipment, with the convertible and hardtop versions all getting a continental tire at no extra cost. Production for the model year was 31,788 and included 9 Deliveryman models in the station wagon body, 15,255 Country Club hardtops, 10,598 Convertible Landaus, 10,600 Custom station wagons (of which 3,536 were in the Greenbrier trim and 7,035 with 3M‘s “Di-Noc” simulated wood-grain trim), and 1,114 standard wagons. The four-door Rambler sedan was at first only available in “Custom” trim. The “Country Club” hardtop became available in the lower-priced “Super” trim and without the “Custom” model’s standard Continental tire (external spare tire carrier). The 4-door station wagons were designated Cross Country and featured an unusual roofline that followed the slope of the sedan’s roof and then dipped down before leveling and continuing rearward. The design by Bill Reddig allowed the use of the same dies to produce door framing for sedans and station wagons, while the dip in the rear portion of the roof included a roof rack as standard equipment to reduce the visual effect of the wagon’s lowered roofline. There was turmoil in the U.S. automobile market as the Ford-Chevy sales war broke out and the two largest domestic automakers cut prices to gain sales volume. This battle decimated the remaining independent automakers in their search for customers. This marketing war put a squeeze on the much smaller independent automakers so even though the Nash Rambler economy cars proved popular, they were not particularly profitable. On May 1, 1954, Nash and Hudson Motor Car Company announced a merger, and the successor corporation was named American Motors Corporation (AMC). Following the merger, Hudson dealers began receiving Ramblers that were badged as Hudson brand cars. The Hudson Ramblers and Nash Ramblers were identical, save for the brand name and minor badging. As part of the facelift for 1955, the Rambler’s grille was also redesigned with only the center emblem differentiating the cars now sold by both Nash and Hudson dealers. The Rambler was a new model for Hudson dealers and it replaced the compact Hudson Jet. The interiors of the economical Nash Rambler were designed by Helene Rother to also appeal to the feminine eye. 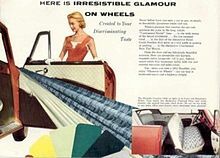 American Motors featured “Created to Your Discriminating Taste” in the car’s marketing knowing what women looked for in a car and Rother’s designs featured elegant, stylish, and expensive fabrics that coordinated in colors and trim. Model and trim combinations were again reshuffled with a two-door Suburban and Club two-door sedans available in “Deluxe” or “Super” versions. Four-door sedans and wagons came as Super or Custom models, while a new Deluxe four-door sedan was introduced. The pillarless Country Club hardtop was reduced to only the “Custom” trim, while the convertible model was no longer available. Fleet sales only versions included a Deliveryman wagon that was not shown in the regular catalog, as well as another new model, a three-passenger business coupe: a two-door sedan with no rear seat. The automaker’s marketing efforts included sponsorship of the Disneyland television show on the ABC network. The inaugural broadcast was on 25 October 1955; just five days after the new Ramblers debuted in both Nash and Hudson dealerships, and the Disney show quickly become one of the top watched programs in the U.S., thus helping AMC sell more cars. The focus continued on economy and a Rambler four-door set an all-time record for cars with automatic transmissions of 27.47 mpg-US (8.56 L/100 km; 32.99 mpg-imp) in the 1955 the Mobil Economy Run. The U.S. domestic market was turning to bigger and bigger cars; therefore, prospects for the compact Nash Rambler line was limited and production was discontinued after the 1955 model year. The smallest car in the July 13, 1951, 400-lap NASCAR sanctioned Short Track Late Model Division race in Lanham, Maryland, was a Nash Rambler Country Club (two-door hardtop). Owned by Williams Nash Motors of Bethesda, Maryland, the car was driven to victory by Tony Bonadies. He stayed in the back of the 25-car field on the quarter-mile track until making a steady move up to the lead position. The Nash Rambler was also the only car to run the entire 100-mile (161 km) race without making a pit stop. On July 18, 1952, the NASCAR Short Track race at the Lanham Speedway, was 400 laps on 0.2-mile paved oval for a total of 80 mi (129 km) miles. Tony Bonadies finished the race in 4th place in a 1952 Nash. The sales war between Ford and Chevrolet that took place during 1953 and 1954 reduced the market share for the remaining automakers trying to compete against the standard-sized models offered by the domestic Big Three (General Motors, Ford, and Chrysler). American Motors responded to the changing market by focusing development on the 108 in (2,743 mm) wheelbase four-door versions that it had introduced in 1954. 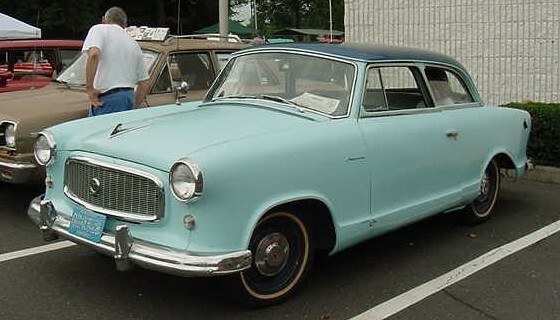 Production of the original compact Nash Rambler ended in 1955 as AMC introduced an all-new Rambler for the 1956 model year. These used the 108 in (2,743 mm) wheelbase and became larger cars, but were “compact” compared to ones made by the Big Three. The bigger Rambler models were sold by both Nash and Hudson dealers and they carried respective Nash and Hudson brand logos. The new for 1956 Rambler was arguably “the most important car American Motors ever built” in that it not only created and defined a new market segment, emphasized the virtues of compact design, but also enabled the automaker to prosper in the post-World War II marketplace that shifted from a seller’s to a buyer’s market. The new Ramblers came only as four-door models. Along with the usual four-door sedan and station wagon was a new four-door hardtop sedan, as well as an industry first, a four-door hardtop station wagon. An OHV version of the 195.6 cu in (3.2 L) engine was also introduced for 1956 to replace the L-head version that was used in previous models. The OHV I6 was the only engine available in the 1956 Ramblers as the new AMC V8s did not appear until the 1957 model year. With AMC’s focus on economical automobiles, management saw an opportunity with the economic recession of 1958 to revive the small 100 in (2,540 mm) wheelbase Nash Rambler. The automaker had retained the old tooling and the old model would fit between the bigger 108 in (2,743 mm) wheelbase family-sized Ramblers and the imported two-seat 85 in (2,159 mm) wheelbase Nash Metropolitan. This would be a smaller and more efficient alternative to the standard-sized cars that were marketed by the domestic Big Three at that time. The old Nash design was slightly modified and used for AMC’s “new” 1958 Rambler American. The book listing the 75 noteworthy American automobiles that made news from 1895 to 1970, documents “the 1950 Nash Rambler was a historic car on two counts: its ancestry and its small size.” While other compact-sized cars were introduced by the small independent automakers, such as the Henry J, Hudson Jet, and Willys Aero, only the Rambler survived long enough to establish a real place in automotive history. Third generation – 1966 4-door sedan. This example sports a 1969 grille. The Rambler American is an automobile manufactured by the American Motors Corporation (AMC) between 1958 and 1969. The American was the second incarnation of AMC’s forerunner Nash Motors second-generation Rambler compact that was sold under the Nash and Hudson Motors marques from 1954 and 1955. 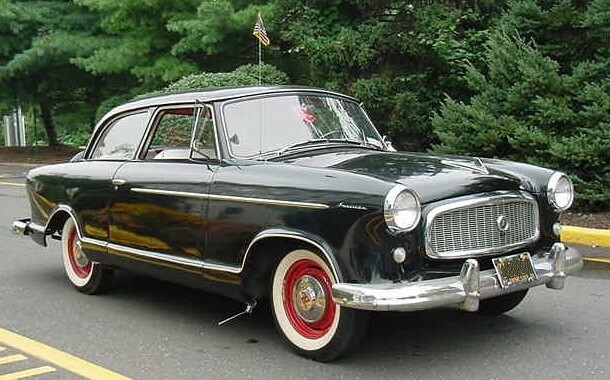 The genesis of the Rambler American began with the Nash Rambler, introduced in 1950. AMC President George Mason believed in small cars, and had introduced the Austin built/Nash designed Metropolitan in 1954. The Rambler line grew to a larger size (108″) in 1956. The cost to produce the Metropolitan were rising, so AMC decided to reintroduce a modified version of the 1955 Nash Rambler (the last 100″ wheelbase model). The domestically produced replacement let AMC control costs more closely. New AMC president George Romney also wanted to build momentum in AMC’s challenge to the domestic Big Three automakers by adding a third car line. The introduction of the new low priced sub compact Rambler was ideal—America had just entered into a recession in 1958 as the car was introduced. The first proposals were to modify AMC’s captive import by extending the Metropolitan with a station wagon type roof design to make room for four passengers. However the 85-inch (2,159 mm) wheelbase of the Met severely limited the necessary interior room, and costs of the overseas built model were harder to control. On the other hand, the company had retained the tooling from its 1955 model Rambler. The old model’s 100-inch (2,540 mm) wheelbase fit between its bigger family-sized 108-inch (2,743 mm) wheelbase Ramblers and the small import. The old design could be slightly modified and then used for the basis of the “new” American. American Motors’ financial condition meant it could not afford to develop an entirely new model. The reintroduction of the old model leveraged the Rambler’s renown for fuel economy and wins in the Mobil Economy Runs, with the consumer’s need for a smaller and more efficient alternative to the standard-sized cars that were marketed by the domestic Big Three (General Motors, Ford, and Chrysler) at that time. American Motors’ designers gave the car a new grille and more open rear fender wells, giving the car a lighter appearance than that of the earlier car, which had hidden its rear wheels behind deeply skirted fenders. The original taillights were turned upside down, saving money on retooling. This design was originally mandated by Nash’s Airflyte styling motif, which sought to reach for the blinding optimism of post-World War II transportation. The car’s seemingly narrow 55-inch (1,397 mm) track was not much different from the industry standard, but rather an illusion fostered by the bulbous bodywork. Romney worried about cannibalizing sales of his larger, more profitable senior Ramblers, so for 1958, the American was available only as a two-door sedan (senior Ramblers came only in a variety of 4-door body styles.) The only engine was a 195.6 cu in (3.2 L) flathead six producing 90 hp (67 kW; 91 PS). The American went on sale late January 1958, with a minimum of marketing and promotion. It was available in two trims, a base Deluxe model priced at US$ 1,789 allowing AMC to claim the lowest-priced car made in America (adjusted only for inflation, equal to US$14,624 in 2015 dollars) and as a Super trim version for $1,874 offering more “luxuries”. The car was advertised as being the only small car with an automatic transmission. All Americans were completely dipped in rust proofing. Reports by owners praised the car’s economy of operation, but ranked at the top its ease of handling. A “workhorse” priced at under $2,000 “it doesn’t look as though every penny was pinched out of it”, but retains a “chic look”. The American found 30,640 buyers during the abbreviated 1958 model year and helped Rambler become the only domestic make to post an increase in sales that year. A two-door station wagon was added to the line in 1959. With the larger Rambler Six wagons offered only as four-door models, AMC’s management thought there would be little sales cannibalization from the American. The Deluxe wagon was priced at $2,060, while the $2,145 Super version included a standard cargo-area mat and roof rack. A Deliveryman commercial wagon, with no rear seat and an extended cargo floor, was available, but found few takers. Self-adjusting brakes were added in 1959. Rambler sales increased in 1959, and AMC struggled to keep up with demand as production tripled to 91,491 Americans, with 32,639 (almost 36 percent) made up by the new wagon. The two-door sedans each sold nearly as well, also, at 29,954 for the lower-priced Deluxe and 28,449 for the top-line Super. For the 1960 model year, the Rambler American line added a four-door sedan body style and a third trim level, a top-of-the line Custom. The new four-door rode on the same 100 in (2,540 mm) wheelbase as the other models and was meant to battle the newly introduced compacts from the Big Three, the Ford Falcon, Chevrolet Corvair, and Plymouth Valiant. The new Custom model came standard with a new 195.6 cu in (3.2 L) overhead valve engine with a slightly higher compression ratio of 8.7:1 producing an additional 37 hp (28 kW; 38 PS), for a total output of 125 hp (93 kW; 127 PS), while the base models retained the flathead as the standard engine. The flathead six had no visible intake manifold since it was integrated within the cylinder head, while the exhaust manifold is a “log-type” that looks like a long tube. All models received an enlarged gas tank, now 22 US gal (83 L; 18 imp gal) capacity, while power steering was a new option. Even in the face of the new competition from much larger automakers, the compact Rambler American enjoyed appeal not only because of its low initial price, economy and high gas mileage, but also because its resale values ranked among the highest. The suggested delivered price for the Deluxe 2-door sedan was $1,795, and it was advertised as the lowest priced car in America. Demand for the traditional American continued to grow as sales increased to 120,603 units (of which 44,817 were two-door sedans, 46,973 four-door sedans, and 28,813 station wagons), thus helping AMC reach 7.5 percent of the U.S. market with a total Rambler sales of 485,745 automobiles and third place among domestic brands. The second generation Rambler American was achieved through a heavy restyling of the previous year’s model under AMC’s styling Vice President Edmund E. Anderson. While mechanically identical to the 1960 model, Anderson’s restyle resulted in a car that was three inches (76 mm) narrower and shorter in its exterior dimensions with an overall length of 173.1 inches (4,397 mm), but increased in its cargo capacity. Continuing to ride on the 100-inch (2,540 mm) wheelbase, the American’s new styling was more square (sometimes described as “breadbox”) instead of the round “rolly-polly” shape (or “bathtub”), and the visual connection with the original 1950 Nash model had finally disappeared. 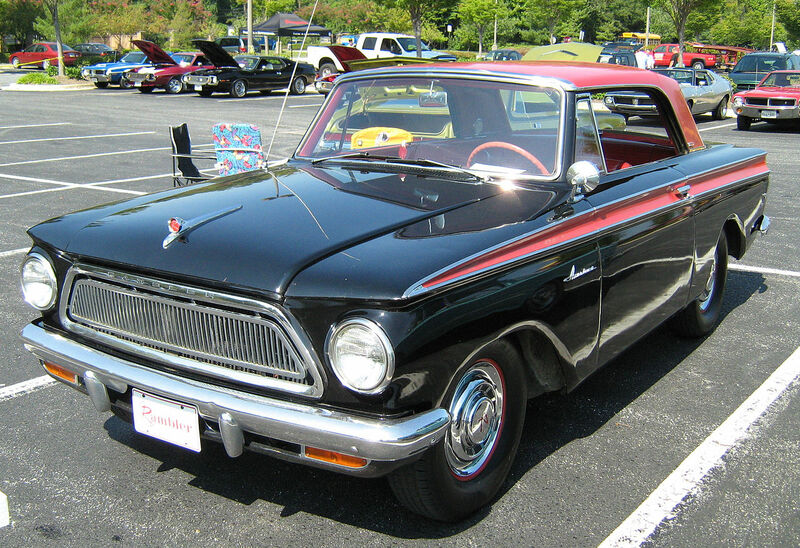 Popular Mechanics wrote “seldom has a car been completely restyled as the 1961 Rambler American and yet retain the same engine, driveline, suspension on the same unit body”. All outside sheetmetal was changed, but the side window frames remained the same as previous models. Only the back glass changed to conform to the new roof line. The firewall and dash board were new stampings, with the brakes moved from under the floor to the firewall. For 1961 the American line added a four-door station wagon, as well as a two-door convertible for the first time since 1954. It featured a power-operated folding top with roll-down door glass, rather than the fixed side-window frames of the original design. Passenger room increased from five to six. The straight six was modernized with an overhead-valve cylinder head for higher-grade models, but the base cars continued with the flathead engine. American Motors built a new assembly plant in Brampton, Ontario, Canada, for the production of Rambler Americans as well as the larger Rambler Classics. Setting new sales records, American Motors continued its “policy of making changes only when they truly benefit the customer.” The 1962 model year Rambler American lineup was essentially the same as in 1961. Model designations were changed with the Custom trim becoming a 400. A new “E-stick” option combined a manual 3-speed transmission with an automatic clutch as a low-cost alternative to the fully automatic transmission. The E-stick was also available in conjunction with an overdrive unit. The system cost $59.50, but offered stick-shift economy, performance, and driver control without a clutch pedal by using engine oil pressure and intake manifold vacuum to engage and disengage the clutch when shifting gears. For 1963, model designations were changed once again with the 400 now called 440. A new hardtop (no B-pillar) coupe body design debuted, whose steel roof was designed to mimic the appearance of a closed convertible top. This was a one-model-year-only design with a thin profile, clean lines, stamped faux-convertible ribs, and a textured finish. A special top-of-the-line model called the 440-H was equipped with sports-type features including individually adjustable reclining front bucket seats and a center console, as well as a more powerful 138 hp (103 kW; 140 PS) version of Rambler’s stalwart 195.6 cu in (3.2 L) inline-6 engine. An optional console shifted “Twin-Stick” manual overdrive transmission was introduced. This transmission has a bigger gap between 2nd and 3rd gears compared to the regular three-speed transmissions with overdrive (that operated like a four-speed although the driver needed to know the governor cut-in speed, free-wheeling, as well as when to lock the overdrive in or out). This allowed the transmission to be shifted as a five-speed (1, 2, 2+OD, 3, and 3+OD). The Twin-Stick shifter had the kick-down button on top of the shift lever knob to facilitate five-speed shifting. First as the Nash Rambler and then as two generations of the Rambler American, this automobile platform performed the rare feat of having two distinct and successful model runs, an almost unheard of phenomenon in automobile history. The convertible and hardtop were the sportiest of the final 100-inch (2,540 mm) wheelbase Rambler Americans, and arguably the most desirable now. For its third generation, the American emerged with what would be its only completely new design. The entire line was treated to neat and trim lines with pleasing simplicity (compared to the more boxy predecessors) with characteristic tunneled headlights with a simple horizontal grille between them. 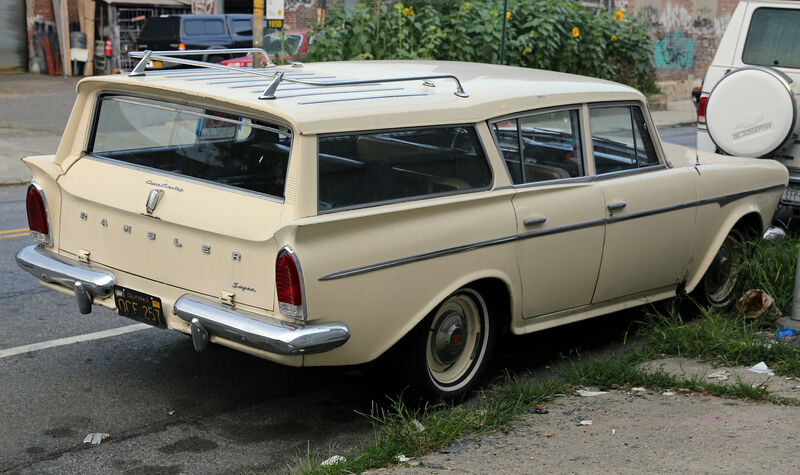 The Rambler American’s wheelbase grew by six-inches or 152 mm (to 106 in or 2692 mm) and the interiors were made more spacious.The station wagons in the restyled 1964 series came with four doors and gained 17% more cargo space compared to the previous design. They all featured a new roll-down disappearing rear window for the bottom-hinged tailgate. Full coil front springs along with soft rear leaf units, gave the new American an unusually smooth ride, better than many larger domestic cars. The new models also incorporated various parts and components (such as doors) that were interchangeable with AMC’s larger cars. In essence, the new body was a shorter, narrower version of the previous years new Rambler Classic. The new styling was the work of designer Richard A. Teague, who would go on to design the 1968 Javelin and AMX. Many viewed the newly designed station wagon as the best looking of any American wagon, with its new, trim lines and ample passenger and cargo room. Led by the top-line 440-series convertible, they were arguably the 1964’s most attractive Detroit compacts. Car Life magazine titled its road test of the 1964 Rambler American: “The Original Plain Jane Compact Car Just Got Back From the Beauty Parlor”. In addition to the top-of-the-line 440 models, the cheaper 330 and 220 models were also available, and Rambler American sales soared to a record 160,000-plus. The old 195.6 cu in (3.2 L) I6 was a gas stingy champ in the Mobil Economy Runs and available in 90 hp (67 kW; 91 PS), 125 hp (93 kW; 127 PS), and 138 hp (103 kW; 140 PS) versions. However, American Motors focused its marketing on the economy of the new models, an advertising of a kind that was previously only popular during the Great Depression. The company’s series of “Love Letters to Rambler” advertisements included “ordinary user testimonial” about the economy and reliability of their Ramblers, rather than in pursuit of buyers in the whole compact car market segment, a strategy that was copied ten years later by Datsun. The 1965 Americans were little changed, but were advertised as “The Sensible Spectaculars”. This was part of Roy Abernethy‘s strategy for AMC to shed its “economy car” reputation and take on the domestic Big Three automakers in new market segments. There were few changes to AMC’s smallest models, as Abernethy pinned his hopes for recovery not so much on the low-priced Rambler American as on the medium and higher-priced Classic and Ambassador lines. As the automobile marketplace in the U.S. was moving away from economy and toward performance and upmarket vehicles, American Motors began removing the historic Rambler name from its larger models. However, the American and Classic models retained their economy car marketing image and their traditional nameplate. To cement this image, a Rambler American was again the overall winner in the Mobil Economy Run. The mid-trim level 330 model was dropped, leaving the top 440 and base 220 models in the lineup for 1966. The top of the line model, available only as a two-door hardtop, saw its name changed from 440-H toRogue. The American models were facelifted for the 1966 model year with more squared-off front and rear styling. The front of the car was extended to add three inches (76 mm) to the inside of the engine compartment. This allowed air conditioning to be used with the new 199 and 232 in-line six-cylinder engines., which were longer than the old 195.6 models. A completely new 290 cu in (4.8 L) “Typhoon” V8 engine was developed by AMC and it saw its introduction in a special mid-1966 Rogue model. Available in 200 hp (149 kW; 203 PS) two-barrel carburetor version or producing 225 hp (168 kW; 228 PS) with a 4-barrel carburetor and high compression, the new engines utilized “thin-wall” casting technology and weighed only 540 pounds (245 kg). The newly powered Rogue came with a 3-speed automatic transmission or a floor mounted 4-speed manual, and made the car “suitable for the Stoplight Grand Prix.” American Motors’ new engine design would expand in power and in applications across the company’s passenger cars, as well as eventually in Jeeps, and then continue to be assembled through 1991 for the Jeep Grand Wagoneer; long after AMC was sold to Chrysler. The 1967 model year Rambler American used the same body styling as the previous year’s models, with only minor changes that included new taillamps and full-length body moldings on 440 and Rogue models that was now positioned lower on the sides. The last convertible available in the American series was in 1967, and it was moved up from 440 models to join the hardtop in the Rogue trim version. The American was available in nine models, and was the only U.S. compact to be available in “all” body styles (2-door, 4-door, sedan, wagon, pillar-less hardtop, and convertible). For 1967 only, AMC’s new high-compression (10.2:1), high (octane rating) 343 cu in (5.6 L) V8 engine with a 4-barrel carburetor that produced 280 hp (209 kW; 284 PS) and 365 pound force-feet (495 N·m) of torque @ 3000rpm, was optional in Rogue and 440 models. Factory installations of this engine were in 58 Rogues and just 55 in the 440 models, with seven of them being in the convertible version. Out of the total production of 69,912 Rambler Americans for the 1967 model year, 921 were Rogue convertibles. Rogues also received grille trim that wrapped around the fender sides. All Rambler Americans received a new grille insert with prominent chromed horizontal bars. The 1967 Rogue models were available in new two-tone paint schemes for the roof, trunk lid and hood that included border trim along the upper body line. The two-door hardtops were also available with a black or white vinyl roof cover. Taillight lenses were more sculptured into the rear panel. The 1967 model year also saw the addition of the new safety standards for passenger cars mandated by the U.S. National Highway Traffic Safety Administration (NHTSA). The regulations began with seat belts on automobiles produced after March 1, 1967. The 1967 Rambler Americans also included a collapsible, energy-absorbing steering column and steering wheel, more padding on interior surfaces, 4-way hazard flashers, and locking seat back latches for 2-door models. The instrument cluster was changed from the previous rectangular design, to round gauges: the center dial housing the speedometer and odometer, the with twin smaller fuel and engine temperature gauges and matching warning light pods flanking each side of the speedometer. All 1967 Americans were covered by AMC’s comprehensive warranty designed to increase customer confidence in their vehicles with the tagline: quality built in, so the value stays in. It was the strongest backing among all the automakers up to that time: 2-years or 25,000 miles (40,000 km) on the entire automobile, as well as 5-years or 50,000 miles (80,000 km) on the engine and power train. American Motors continued its industry exclusive ceramic-coated exhaust system as standard on Rambler Americans. Newly appointed as AMC’s new Chairman and Chief Executive Officer, Roy D. Chapin, Jr. began to promote and reposition the Rambler American, the automaker’s least popular line. He bet on the Rambler American to improve the automaker’s financial performance after George W. Romney. Chapin also saw a price gap between U.S. cars and inexpensive imports (primarily the Volkswagen) and lowered the price to make the Rambler American’s “total value superior to the imports, as well as superior in both price and range of choice to U.S. compacts”. The suggested retail price of the base two-door Rambler American sedan dropped to $1,839 (US$ 13,007 in 2015 dollars) (its closest U.S. competitor was the $2,117 Plymouth Valiant), making the larger and more powerful American only $200 more than the Volkswagen Beetle. American Motors announced that it was forgoing the annual styling changeovers that were expected among the domestic firms, thus saving retooling costs and passing on the savings to consumers by keeping the car’s price low. The automaker promised in a special $300,000 ($2,121,856 in 2015 dollars) advertising campaign that future changes to the car will be to enhance the safety and reliability of these cars. 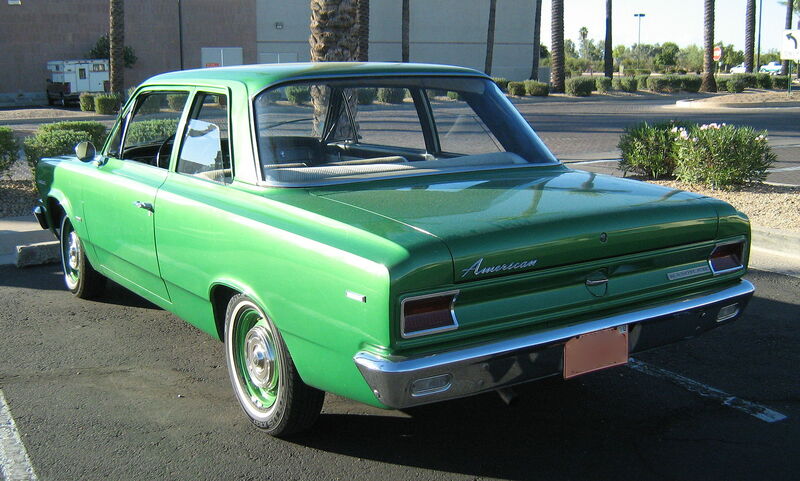 The Rambler American’s recent (1966) redesign was then continued mostly unchanged through the 1969 model year. For 1968, the line was further simplified from nine to five models, with the 2-door coupe and 4-door sedan comprising the base line (with the 220 designation no longer used), 4-door sedan and station wagon being offered in uplevel 440 guise, and a lone hardtop coupe making up the top-line Rogue trim line. 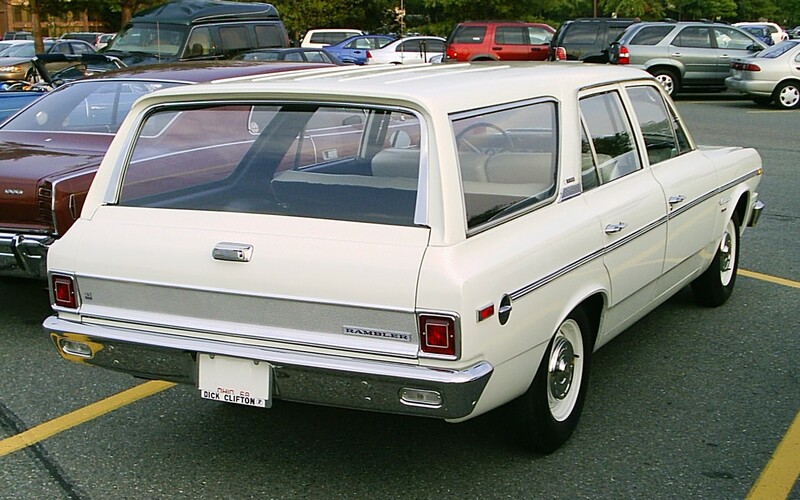 The American, along with “A-body” Chryslers, were the only domestics that came as a hardtop coupe model, the Ford Falcon and Chevy Nova being only available as pillared sedans (and a wagon in the Ford Falcon line). All Americans received a new chrome horizontal grille bar that extended outboard to the headlights, while the grille sections got an attractive “blackout” treatment. The wraparound rear window on the sedans was modified to a flat unit, with a more squared-off “C” pillar, which changed the appearance from the earlier sedans with their overhanging rooflines. The overall affect was a more formal-looking car. The 440 and Rogue versions picked up a stainless steel trim piece running stem to stern on either body side, straight back between the wheel wells and the belt line. At each end of the strip were the newly safety-mandated body side reflectors, amber for the front fenders, red for the rear. The U.S. National Highway Traffic Safety Administration (NHTSA) standards for all passenger cars sold in America for 1968 also called for shoulder harness for the front seats and elimination of reflective interior trim. Other requirements for all cars manufactured after 1 January 1968, included exhaust control systems to help reduce unburned hydrocarbon and carbon monoxide emissions. However, the biggest change was the decision to keep the MSRP (manufacturer’s suggested retail price) of the base two-door model to within US$200 of the Volkswagen Beetle. The domestic Big Three automakers did not respond to this strategy, thus giving AMC a big price differential over the competing domestic models. Sales of the Rambler American increased and the showroom traffic boosted morale among AMC’s independent dealerships. This was backed up by a marketing campaign stating, “Either we’re charging too little for our cars or everyone else is charging too much.” The promotion and lower prices were designed to rekindle the Rambler American as a practical and economical car in customers’ minds. Advertisements by AMC’s new agency, Wells, Rich, and Greene, headed by Mary Wells Lawrence violated the accepted rule of not attacking the competition. 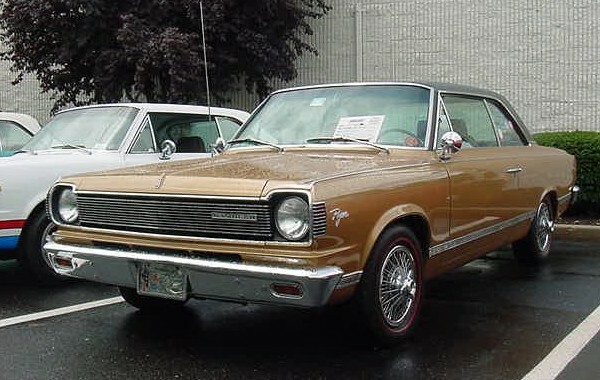 Since its introduction “the Rambler American has done well at American Motors.” For its final model year, 1969, the “American” name was dropped as the car was now referred to as the “American Motors Rambler”. Continuing the tradition of minimal changes, the models received a new “suspended” accelerator pedal and cable throttle linkage. Additional safety equipment for the 1969 models included front shoulder belts and headrests for both front outboard seating positions and the front parking lights stayed on with the headlights. On the exterior, the center horizontal chrome grille bar was deleted. As a true compact-sized car on a 106 in (2,692 mm) wheelbase, the Rambler station wagon had no domestic competitors, and it offered interior space advantage compared to imported models with its 66 cubic feet (1,869 L) of cargo space. Available only in 440 trim, the wagons came with a roll down rear window with drop-down tailgate, as well as a roof rack. In part to commemorate the impending passing of the Rambler name, American Motors added the Rogue-based SC/Rambler to the line (detailed separately). A total production for the 1969 model year was 96,029. The last U.S.-made Rambler was assembled in Kenosha, Wisconsin, on 30 June, making the production total of 4,204,925 units. After the 1969 model year, a completely redesigned model, the AMC Hornet, replaced the American. One of the muscle car era “most visually arresting examples” was a special model was produced during 1969 in collaboration with Hurst Performance, the Hurst SC/Rambler. “Likely the most outrageous musclecar from AMC” with 1,512 built, it was probably the only production model made and promoted for a specific drag racing class, the National Hot Rod Association (NHRA) F/Stock class. The SC/Rambler “became one of the most potent cars of its time, throwing down quarter-mile times that only Hemis and Cobra Jets had previously touched.” A true muscle car with zero options and a suggested retail price(MSRP) of less than US$3,000, it would take down some much more vaunted cars. Each Hurst SC/Rambler came equipped with the 315 hp (235 kW; 319 PS) 390 cu in (6.4 L) AMC V8 engine from the AMX. There were no factory options to this package. Standard clutch was a 10.5-inch (267 mm) with a three finger long-style Borg and Beck pressure plate. The 390 engine was mated to a manual transmission four-speed T-10 with close gear ratios. A Hurst shifter came with a large metal “T” handle. The rear end was an AMC 3.54:1 “Twin-Grip” limited slip differential using Dana internals, with outer wheel hubs attached through a spline and keyway system. The hub attachment method was the only weak point in the rear end assembly. Factory cast iron manifolds exited to a true dual exhaust with Thrush (a Tenneco brand) two-chamber oval mufflers with Woodpecker logos. These were standard baffled mufflers, not glass packs. Minimal baffeling gave a deep throaty sound, similar to modern Flowmasters. The exhaust exited through chrome tips attached with hose clamps. While similar Rogue and American models had drum brakes, the SC package came with front discs, a heavier sway bar, as well as strengthened drive train and body components. These included connectors between the front and rear subframes. The rear end used staggered (fore and aft) rear shock absorbers to eliminate wheel hop (axle wrap) under extreme acceleration conditions with leaf spring suspensions. The staggered shocks required a special plate riveted in the trunk pan, as well as brackets for the subframe end of upper torque links. Other body modifications differentiating all Hurst SC Ramblers from regular hardtop Ramblers included rolling back front and rear wheel openings to allow for larger tires. American Motors called on Hurst to help develop a vehicle for the racing market. Because of stock class rules, a minimum of 500 identical vehicles had to be produced and sold. This led to the SC Hurst Rambler, (SC) meaning “Super Car”. This vehicle is commonly referred to as a “Scrambler”, although Jeeps later used the SCRAMBLER name. Available only as a two-door hardtop, the interior came in standard gray charcoal vinyl upholstered reclining seats with a headliner embossed with small squares. The front seats reclined, and the newly safety mandated head restraints were upholstered in red, white, and blue stripes. The SC/Rambler included a standard 90-degree wide arc scale Sun tachometer. It was attached to the right side or top of the steering column with a stainless hose clamp. The only factory option was an AM radio. The SC/Ramblers came with the wildest factory paint jobs ever put on a muscle car. All featured a forward-facing functioning box-type hood scoop with “390 CU. IN.” and “AIR” in large letters on both sides of it. The hood scoop air flapper was vacuum operated, allowing higher pressure cool air to pressurize a Carter AFB carburetor. A blue arrow on the hood pointed towards the air intake. The Scrambler came only in two types of red, white, and blue color schemes (“A” or “B” trims) with no other options available, with the exception of an AM radio. These schemes appeared randomly through early production. Some AMC historians incorrectly claim that American Motors built a lot of 500 “A” scheme SC/Ramblers before switching to the “B” scheme, with 500 “B” models were built before AMC switched the final lot of 512 SC/Ramblers back to the “A” pattern. However, there are “B” scheme cars in the Hurst SC/Rambler registry with very early build dates putting their manufacture among the “A” scheme versions. AMC used the same paint code for all special paint schemes, so there is no way to determine exactly how the cars rolled out of the factory. Some of the other unique standard items on this model included racing mirrors, anti-hop rear axle links, and blue Magnum 500 steel wheels (common to Fords) with chrome beauty rings and AMC hub centers. Tires were E-70-14 fiberglass belted 4-ply tires with red stripe Goodyear Polyglas tires. American Motors priced the SC/Rambler at $2,998 (after adjusting for only inflation, equivalent to US$19,280 in 2015dollars) a serious dragstrip contender because in its as-sold condition it could do the quarter mile in the low 14 seconds at about 100 miles per hour (161 km/h). For example, Road Test magazine reported 14.4 at 100.44 mph and reached 109 miles per hour (175 km/h) without topping out. With a few simple bolt on modifications they would run low 12’s. Modified SC/Ramblers have run the quarter-mile in the 9-second bracket. The automaker provided AMC dealers with numerous “Group 19” parts and upgrades to make customer’s SC/Ramblers even quicker. Well-tuned legal stock S/C’s with allowable changes have run in the 12-second range. Charles Rauch set a D/S quarter mile record of 12.54 seconds at Detroit Dragway. 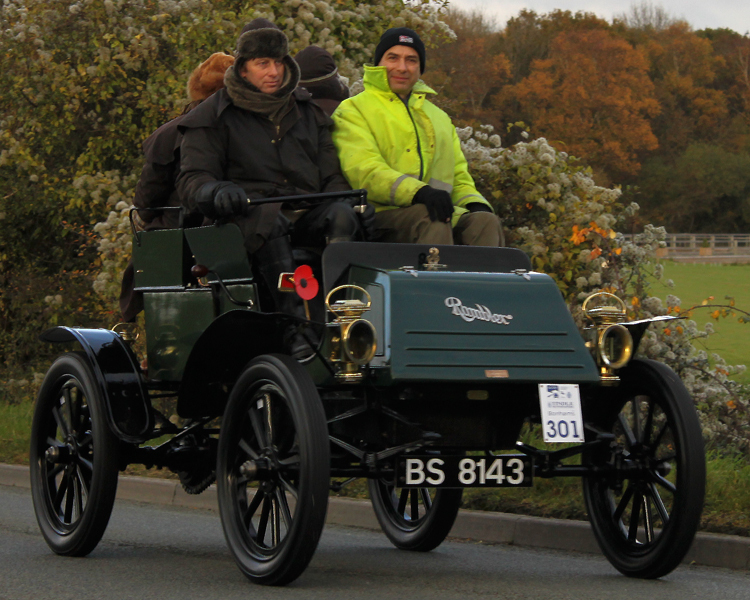 The factory team supported this SC Rambler, often referred to as “The Nash”. Modifications included a special cast iron manifold, advanced camshaft timing, heavier valve springs, factory supplied carburetor, six cylinder front springs with factory supplied bottom shims to restore stock height, 90/10 front shocks, lightened chassis components, exhaust system modifications, Chevrolet 10.5-inch diaphragm pressure plate, wide ratio transmission gear set, 4.44 rear axle ratio, as well as larger, softer, G70-15 rear tires on identical design Magnum 500 15″ Ford wheels painted AMC blue. The manifold and some other parts were specially selected factory components for the stock 340 hp (254 kW; 345 PS) 1970 Rebel Machine engine, but legal for use in the big bore, short stroke 1969 AMC 390 engine. From 1966 to 1982, Industrias Kaiser Argentina (IKA) produced in Argentina a hybrid of the second-generation Rambler American and Classic platforms. The car was called IKA Torino, later Renault Torino, and featured AMC’s Automobile platform with a facelifted front and rear design and instrument panel by Pininfarina to create a new car. The Torino was received by journalists and the public as The Argentinean car. It was available in two-door hardtop and four-door sedan body styles and all came with luxurious interior appointments. The Torino’s engine, transmission, and upgraded interior fittings were unique to Argentina, and were not used on any of the U.S. market Ramblers. The engine was the Kaiser 230 cu in (3.8 L) overhead cam (OHC) six originally developed for the new 1963 Jeeps. The car was actually a 1963-1964 Rambler Classic passenger compartment with 1964-1965 Rambler American front and rear sections. The front suspension sills extended all the way under the floor to meet the rear suspension sills, a feature that made the Torino much stiffer than its U.S. produced cousins (The Rambler Marlin also used these long sills, but other models did not). The Torino handled the roads of the interior of the country very well while its engine acquired fame for being robust and reliable. The car was successful in Argentina. It was also entered in races against famous sport cars, including the “84 hours of Nürburgring” endurance race in 1969, where a Torino finished with the most laps, but was classified in fourth place due to penalties. From 1967 to 1974, the 1966 version of the AMC Rambler American was assembled by the Sherkate Sahami Jeep company in Iran. The American was offered in two trim levels as Aria (sometimes spelled “Arya”) and Shahin. The Aria was a more luxurious version that came with a 3-speed automatic transmission, while the Shahin was the base model with a manual transmission. The engine used was AMC’s 195.6 cu in (3.2 L) inline-six producing 128 hp (95 kW; 130 PS). 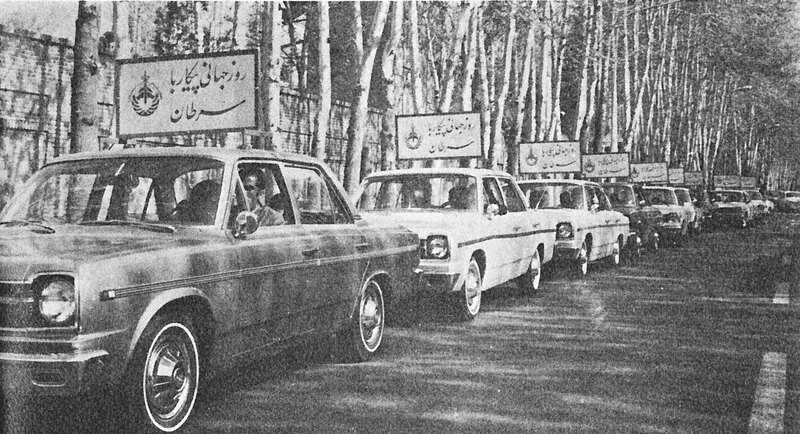 The cars were available with factory air conditioning, a unique feature for the Iranian market during that time. Production was continued by the Iran Jeep Company plant in Tehran. The Iran Jeep Company (Sherkate Sahami) formed a new company called General Motors Iran Ltd. in June 1972, and after production of Rambler Americans ended in early 1974, they continued to produce selected Opel Rekord, Chevrolet Nova and Pickup, Buick Skylark, and Cadillac Seville models from 1974 until 1987. 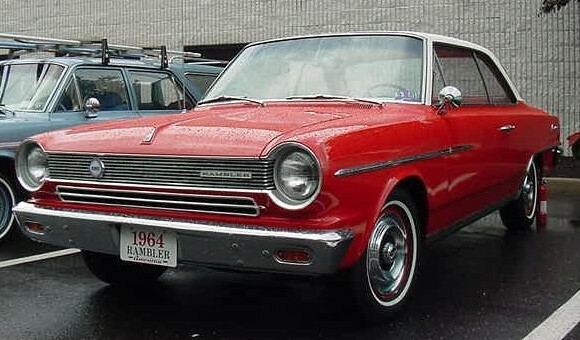 The Rambler American was introduced to the Australian market in 1964. It was built by Australian Motor Industries in Port Melbourne from complete knock down (CKD) kits shipped from the U.S. The driver’s position was moved from left to right hand to comply with Australian law. There were also differences and overlaps in the Australian production and equipment compared to U.S. model years. The 1965 model Ramblers were produced trough 1966, mostly in 440 trim and with the smaller 195.6 cu in (3.2 L) engine. Because AMI assembled other automobile brands at its facility (including Toyotas and Triumphs), there were some sharing of colors, options, and interior trims. By 1967, the local content of the Rambler Americans had been progressively raised to 53%. Important for the Australian market, the Rambler was considered reliable, with the mechanicals being generally solid and trouble free. 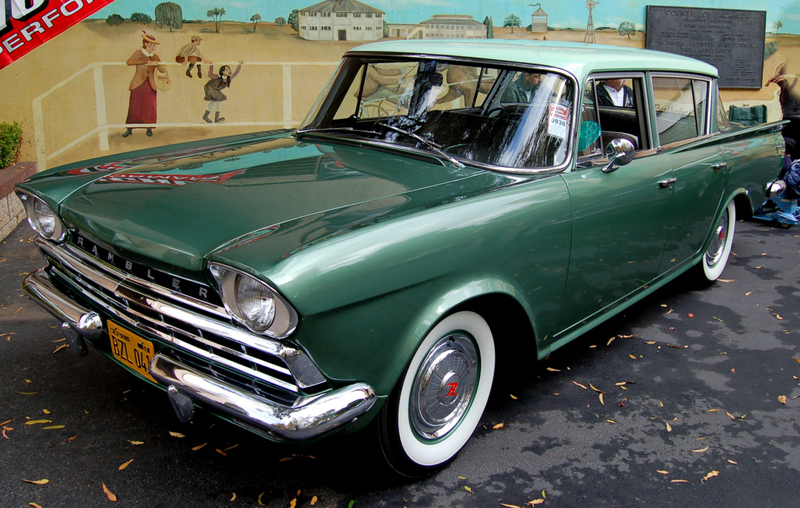 The Rambler American was introduced to the Mexican market in 1958 through direct importation from the US. Early in the year, American Motors signed an agreement with an assembly plant based in Monterrey, Nuevo León, that produced a number of vehicles for different makes and had its own dealership network. Virtually, the whole Rambler line was available. However, the production and sales volumes were fairly low and the agreement was terminated in late 1959. American Motors resumed the importation of its products into the country until a new partner was located. Early in 1960, the company signed a new agreement with Willys Mexicana S.A. de C.V. and the first model produced was none other than the Rambler American, becoming the first American Motors product made and sold by what would become Vehículos Automotores Mexicanos S.A. The 1960 Rambler American produced under Willys Mexicana was available in two-door sedan, four-door sedan and two-door station wagon body styles. They were powered by a 90 hp L-head 195.6 cubic inches six cylinder engine with 8.0:1 compression ratio and single-barrel carburetor coupled to a three speed manual transmission with column shift. Among its characteristics it featured a built-in flow through ventilation, four-wheel drum brakes, standard suspension, pull-handle parking brake, front parking lights, marker lights, bench seats, four side armrests, vacuum wipers, cigarette lighter, front ashtray, hood ornament, glove box, driver’s side remote mirror and hubcaps over standard wheels. 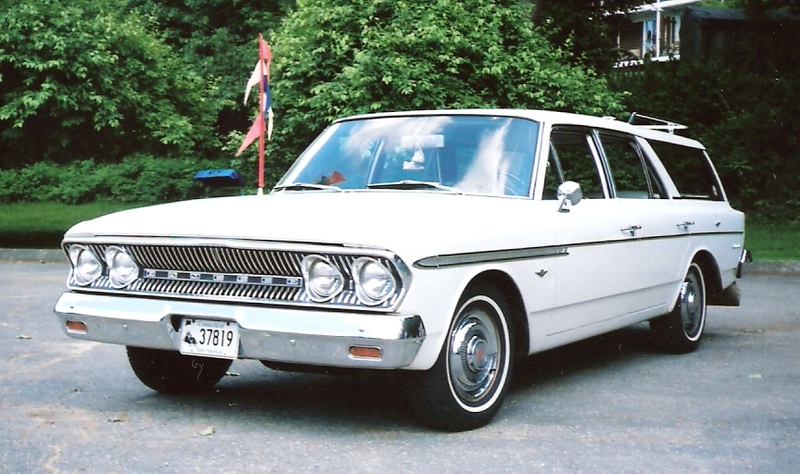 For 1961 the Rambler American for Mexico was available as the new second generation of the line, growing from three to four body styles with the introduction of the four-door station wagon. Wipers and washers changed to electric units, an Motorola AM radio with antenna and twin-circuit brakes became standard. The line continued with minor changes in 1962 and 1963. The most important aspect came in 1963 with the introduction of a fifth body style (two-door hardtop) that would become VAM’s first limited edition; the Rambler American Hardtop, Mexican equivalent to the Rambler American 440H model in the US. The car became the company’s first sporty compact as well as its first luxury one. 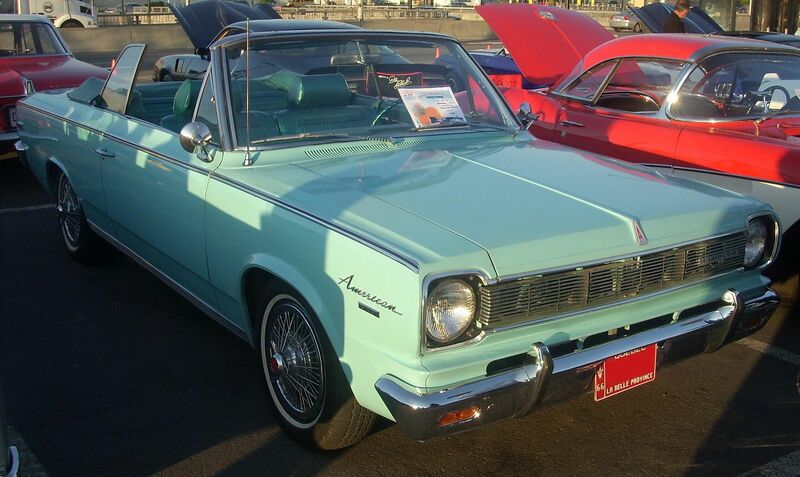 For 1964, the third generation Rambler American debuted in Mexico. The year’s line can be described as consolidated since it was available only as a two-door sedan, four-door sedan and four-door station wagon. The only engine available was still the L-head 90 hp 195.6 cubic inches inline six cylinder, but not much later it was replaced by the one-barrel 127 hp OHV version. The Rambler American line for 1965 switched to the new one-barrel 145 hp 232 cubic inches inline six cylinder engine, an aspect that was hidden from the public. The cars were advertised as being equipped with the also new 199 cubic inches six cylinder series, which wouldn’t be available until the midyear. The 232 engine series was already being produced in Mexico while the 195.6 engine series was imported from the US. In terms of product line volumes, warrantly claims among others, having those two engines available was not a cost-effective procedure. The company intended to consolidate and standardize production as much as possible, which was achieved by terminating the 195.6 engines and offer both the Rambler Classic and Rambler American lines with the 232 engines until the 199 was available for the latter. Had VAM announced the 232 six cylinder engine from the beginning in the Rambler American line and subsequently announcing the change to smaller less powerful engine would have taken its toll on the company’s image among the public. Also, announcing the 232 in the Rambler American from the beginning would most probably reduce any reasons to buy a Rambler Classic instead; a problem American Motors had to bear with under Roy Abernethy when the 287 cubic inch V8 was offered in the 1963 Rambler Classic, drawing several customers away from the more profitable Rambler Ambassador models that shared the same styling. The two new engines were not the only outstanding novelties of the year, the Rambler American Hardtop was resurrected. The model kept the same luxury and sporty touches of the 1963 model and was once again a low volume limited edition. The cars came standard with the two-barrel 155 hp version of the 232 engine coupled to a Borg-Warner “Flash-o-Matic” three speed automatic transmission with floor shift. This was followed by individual reclining seats, high-trim upholstery, center console with locking compartment, two-point front seatbelts, custom wheel covers and bright molding package. The Mexican Rambler American for 1966 and 1967 saw mostly the same cosmetic changes as its US counterparts. The hardtop model departed once more and the line was restricted to the 199 six cylinder with three speed manual transmission on the column. The 1968 models saw stronger changes in the form of the 232 engine as included standard equipment in the station wagon while becoming optional equipment in both sedan models. The 1969 models were almost the same with only minor changes. The most important aspect of the year for the line was the creation of VAM’s own original performance model in the form of an optional package for the two-door sedan. The model in question being the Rambler American Rally. This model was inspired by VAM’s successful 1965 racing season using Rambler American sedans and hardtop as well as the still building enthusiasm for the new muscle cars. 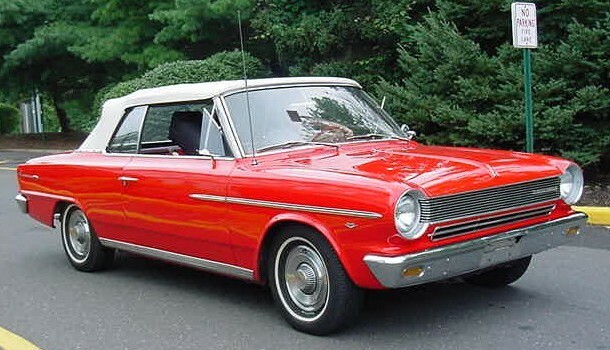 The Rambler American Rally coincided in several aspects with the 1965 Rambler American Hardtop model. The package consisted of a two-barrel 155 hp 232 six cylinder, power drum brakes, fender-mounted “232 SIX” rectangular emblems and individual reclining front seats with center folding armrest. The only transmission available was still the three-speed manual with column-mounted shifter, even though a floor-mounted gearshift was available as an option. Other optional items applicable to performance included an over-dash 8,000 RPM tachometer and the sport steering wheel used in the Javelin models. The closest probable equivalent to this model in the US is the Rambler American Rogue, despite being a hardtop instead of a sedan and the lack of a V8 engine. 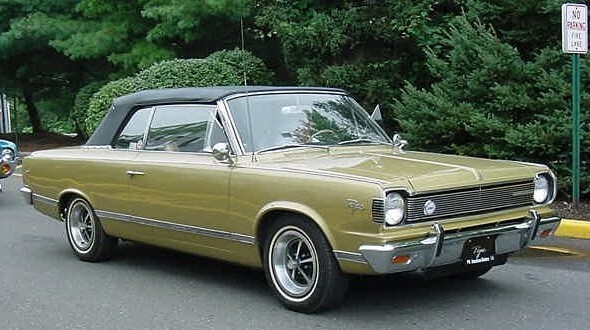 Like in the US, the Rambler American line was discontinued in 1969 in Mexico to make way for the all-new Hornet models. 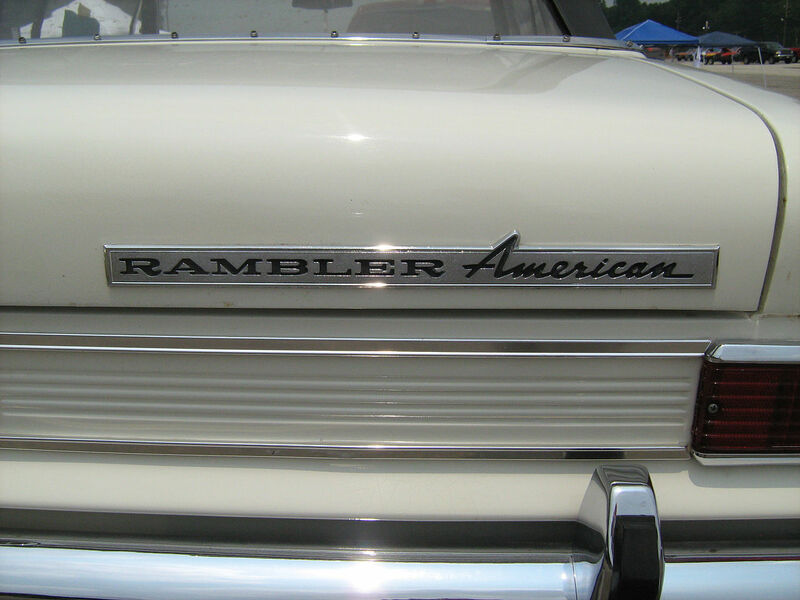 While the line was changed, the “Rambler American” name lived on the new Mexican-made compact. The Rambler American in Mexico always kept a high popularity and positive image among the Mexican public. For these reasons, the relatively similar styling and overall appearance between the old and the new model, and because VAM felt that the name “Hornet” would have no connotation whatsoever in the local market it was decided keep the predecessor’s name for the new line. The Rambler American model lived on as a “fourth generation” until its discontinuation in 1974; replaced with the updated and expanded new VAM American line for 1975. The last hurrah for the true original Rambler American models in Mexico came in 1970 in the form of the four-door station wagon. While American Motors had two station wagons models to offer in 1970, the Rebel and Ambassador units, VAM had no station wagon other than the Rambler American-based unit. With the introduction of the new Hornet-based Rambler American that did not have a station wagon body style available, VAM could not afford the luxury of not offering one. The company decided to carry over the third generation station wagon for one more full year. The 1970 Camioneta Rambler American became the first VAM regular production compact model to offer a three speed automatic transmission as an option. Among other unique options was a bright molding package that included “440” emblems, even though there really were no different trim levels or versions that existed. The model was replaced in 1971 with the equivalent Hornet Sportabout version. 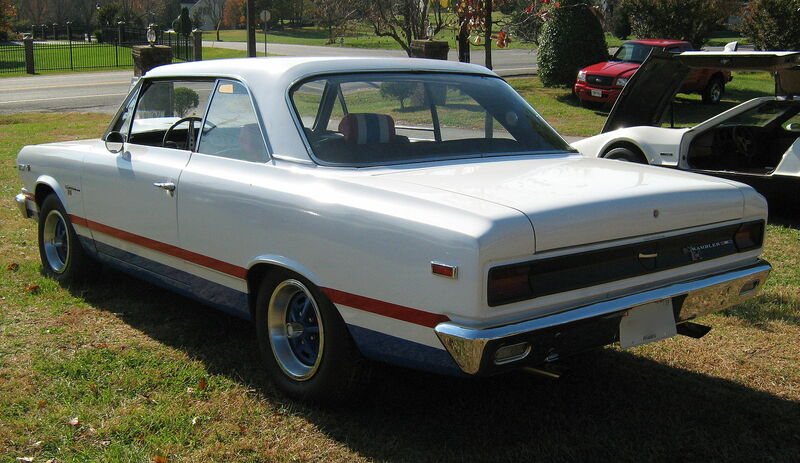 The Rambler American also served as the basis for the Rambler Tarpon, a sporty 2 plus 2 “youth-oriented” concept car. The semi-boat tail roofed fastback hardtop coupe was developed in 1963 from the tooling that was already set for the 1964 model year Rambler Americans. Shown before the introduction of Ford’s compact Falcon-based Mustang, AMC’s show car was “an instant success” with 60 percent of surveyed potential buyers stating they would buy one. The Tarpon was aimed at the Plymouth Valiant and anticipated a new market segment that later became known as the pony cars; however, AMC executives introduced the Rambler Marlin, a larger personal luxury car. The automaker waited until the 1968 model year to introduce the Javelin, a small fastback aimed directly at the market segment that was created by the Ford Mustang. The American was introduced as the North American economy was in a recession and buyers were looking for smaller and more economical cars and the Rambler brand was known as a fuel miser. The Rambler American was a yearly winner of the best fuel economy in the Mobil Economy Run and the Pure Oil Company Economy Trials, even during later years when fuel efficiency was not a major factor in the purchase of automobiles. 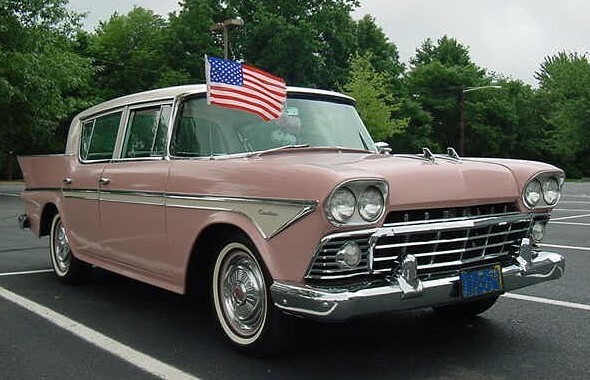 For example, at the conclusion of the five-day event in 1959, that covered 1,898 miles (3,055 km), a Rambler American Deluxe topped the 47-car Mobilgas Economy Run field with an average 25.2878 miles per US gallon (9.3015 L/100 km; 30.3694 mpg-imp). The 1959 Pure Oil Trials were conducted from Los Angeles to Miami, featuring 2,837 miles (4,566 km) covering over all types of terrain and driving types, where a Rambler American with overdrive set the all time NASCAR-supervised coast-to-coast average economy record of 35.4 miles per US gallon (6.64 L/100 km; 42.5 mpg-imp). In the 1964 run, a 6-cylinder Rambler American 440 sedan averaged 27.8336 miles per US gallon (8.4507 L/100 km; 33.4268 mpg-imp); once again, the best of all the cars that year. Economy claims for stock cars could be confirmed by these open and sanctioned trials. 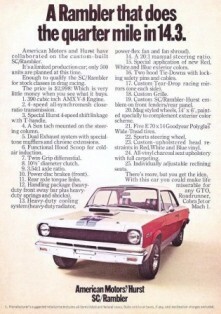 American Motors (as well as its OEM suppliers, such as the print advertisement for Champion spark plugs) promoted the results of this popular event in its advertising as a marketing technique that further emphasized the thriftiness of the Rambler Americans. Rambler’s emphasis on economy over performance can be observed through the example of automatic transmission use in a Rambler American where the 1959 owner’s handbook describes leaving the gear selector in the D-2 position (1.47:1 gear ratio) blocks access to low gear (2.40 ratio) when starting out from a stop; therefore, given the car’s 3.31 axle, this yields an initial 4.86:1 final drive ratio reducing crankshaft revolutions for maximum fuel economy. In 1958, the Playmates recorded a novelty song called “Beep Beep” about a duel between a Cadillac driver who just cannot shake a “little Nash Rambler” following him. The song uses an accelerating (accelerando) tempo and ends with the Rambler passing the Cadillac “…in second gear!” The song was on Billboard Top 40 charts for twelve weeks while also selling over one million copies, and it was awarded a gold disc. 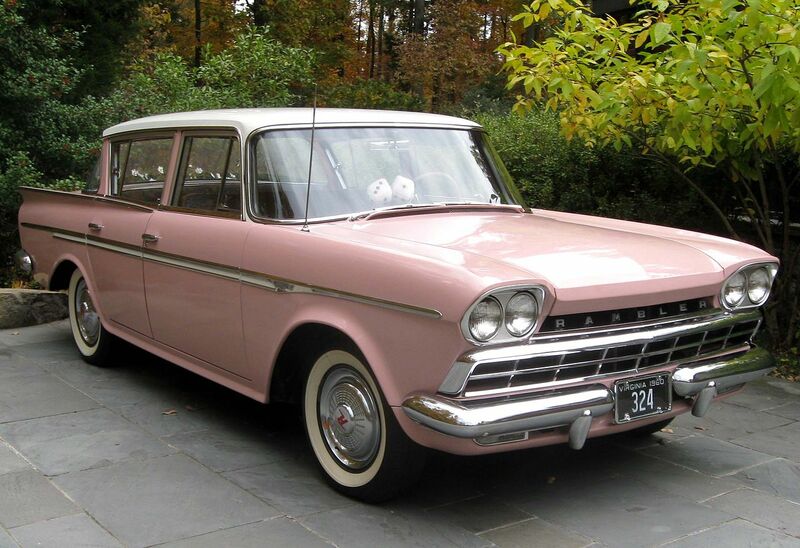 Concurrently with the popularity of this song, AMC was setting production and sales records for the Rambler models. This was also the same year the old Rambler reappeared as the new American, with the song popularizing the re-released car and making AMC the only automaker have increased sales during the recession of 1958. Mexico hosted a grueling mostly off-road race, the Baja 500. In July 1967, a Rambler American in the passenger-car category was driven by Spencer Murray and Ralph Poole and finished the run in a record 31 hours. American Motors then got serious in this type of racing and signed up James Garner‘s “American International Racers” (AIR) team to a three-year contract. Garner’s shops prepared ten 1969 SC/Ramblers provided by AMC. The cars were modified for the punishing Baja 500 race. Raising the suspension and using Goodyear tires on 10×15-inch wheels increased ground clearance. All window glass was removed and roll cages were installed. The cars had 44 US gal (167 L; 37 imp gal) fuel tanks. Two cars were further modified with four-wheel drive. The AIR team built AMC’s 390 cu in (6.4 L) V8 engines to blueprint tolerances, thus increasing horsepower to 410 hp (306 kW; 416 PS) at the flywheel. The cars were capable of 140 mph (230 km/h) runs along smooth straights at about 7000 rpm in fourth gear. On 11 June 1969, eight of the Ramblers were entered into the passenger-car category and the two 4WD versions were in the Experimental class. Garner did not drive in the race because of a film commitment in Spain. Seven of the Ramblers finished the grueling race, taking three of the top five places in the passenger-car class. 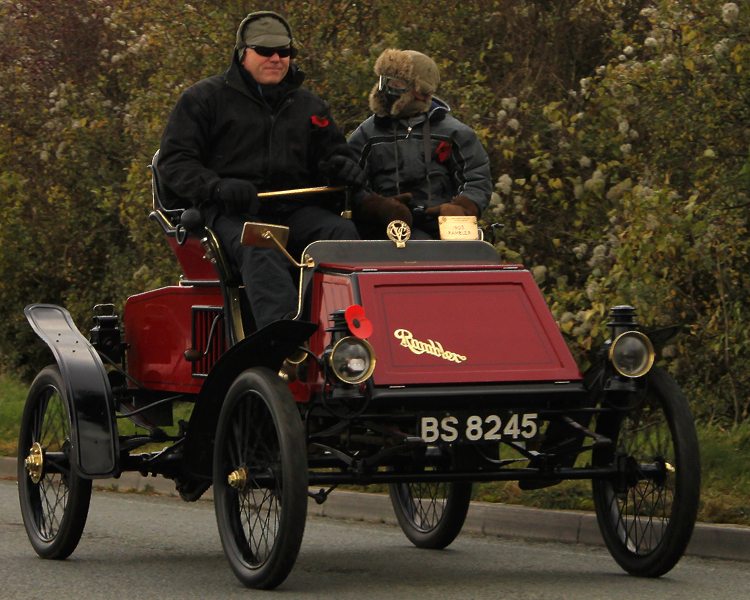 One of the four-wheel-drive cars came in fourth in its class. The AIR team included a car with Bob Bondurant and Tony Murphy that took first place. For one of the winning Rambler drivers, this was his first ever race and the experience launched the career of Walker Evans. Rambler Americans raced with good results in the Shell 4000 Rally that was held in Canada. In 1968, for example, the grueling 4,000-mile (6,437 km) rally over the often-tortuous muddy road from Calgary to Halifax, the AMC team finished 2nd, 3rd, and 5th winning the Manufacturers Team Award. However, independent AMC dealerships began sponsoring cars in drag racing events. Preston Honea achieved fame with the 1964 “Bill Kraft Rambler” American from Norwalk, California. The car had a transplanted AMC V8 engine that was bored out to 418 cu in (6.8 L) with four carburetors on special intake manifold and featured a transistorized ignition system as well as an Isky 505-A camshaft. The big engine from an Ambassador added only 80 pounds (36.3 kg) more than the venerable 195.6 cu in (3.2 L) straight-6normally found in the small two-door American. However, with its 8200 rpm redline, the Rambler ran 112 mph (180 km/h) at the Fontana dragstrip. 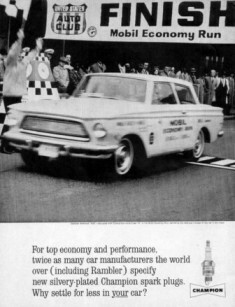 After the departure of Roy Abernethy, AMC eagerly sponsored Rambler Americans in various motorsport venues and produced a factory-ready Rambler American for drag racing — as noted above with the 1969 SC/Rambler. In 1959, AMC and Sonotone Corporation announced work on a car to be powered by a “self-charging” battery. It was to have sintered plate nickel-cadmium batteries. During the 1960s, AMC partnered with Gulton Industries to develop a new battery based on lithium and to use an advanced speed controller designed by Victor Wouk. However, the actual running prototype was a 1969 Rambler American station wagon converted from 290 cu in (4.8 L) V8 to an all car electric using nickel–cadmium batteries. Power consisted of 160 cells, each rated at 75 ampere-hours (Gulton KO-75), arranged in two banks of 80 cells each, and connected in parallel. The equipment Wouk designed “gave it good acceleration, but there was still a problem with the car’s range.” Later, AMC and Gulton developed the Amitron and the similar Electron city cars. American Motors used the compact Rambler American chassis as the basis for the 1968 Javelin, a two-door hardtop marketed as a “hip”, dashing, and affordable pony car, as well as available in several muscle carperformance versions. In 1988 Ben Vaughn, a musician and a longtime Rambler automobile fan, released El Rambler Dorado on his Blows Your Mind album. He later recorded an entire album in his 1965 Rambler American. 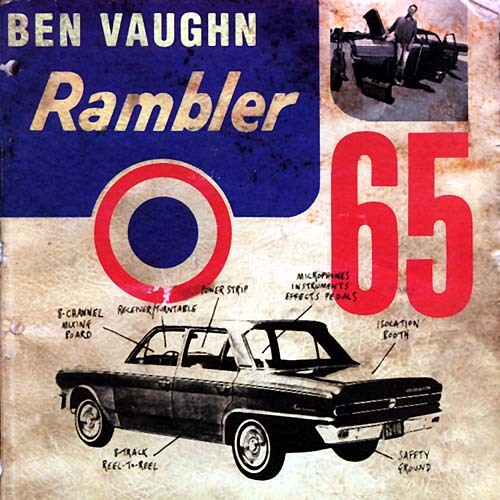 Released in 1997 by Rhino Records and titled Rambler ’65, Vaughn turned his car into a makeshift studio. Putting the recording equipment inside his Rambler was a gimmick or an act of showmanship, but according to most reviews, the music he created inside his car is “timeless” rock roll. The Rambler ’65 24-minute music video also includes vintage AMC TV advertising clips. Vaughn also achieved success in Hollywood as the composer for the hit NBC television series 3rd Rock from the Sun in which the main characters use a 1962 Rambler American convertible. 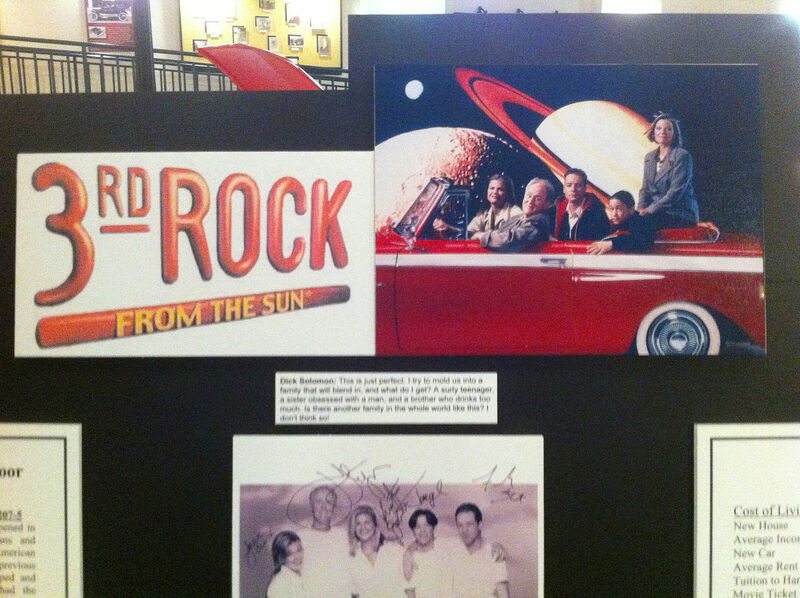 The car is featured in posters and in the 100th episode (during season 5) entitled “The Fifth Solomon”, the space aliens “learn that it’s possible to get emotionally attached to a car” after they crash their Rambler and have no insurance. 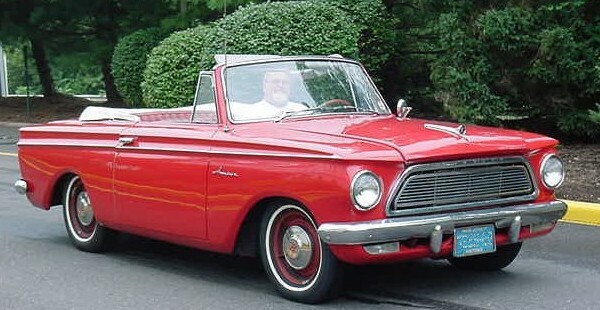 Benefiting from network television exposure, the 1962 Rambler American convertible became “a hot ticket item” for collectors after it began to appear regularly on the sitcom 3rd Rock from the Sun with owners of rusty cars asking high prices and prime examples commanding upward of $14,000. A fully restored 1962 convertible was given to Mitt Romney on his 60th birthday by his son, Tagg, in 2008. The “outlandishly adorned” limited-edition, mid-model year addition to the Rambler line “built under the aegis of the Hurst shifter people” is unique. The SC/Rambler has a strong collector following, with websites, clubs, and a registry. The SC/Rambler has become a popular muscle car to replicate because of the ease of installing a powerful AMC V8 drivetrain into one of the large number of inexpensive 1966 through 1969 Rambler Americans. To identify a true SC/Rambler, it must be a hardtop and the Vehicle Identification Number (VIN) must have the letter M in the third digit and the engine code of X as the seventh digit. 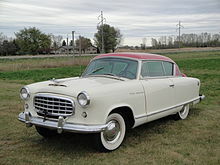 Launched on 15 December 1955, the 1956 model year Rambler Six ushered a “new era in motoring has begun” according to George W. Romney, President of AMC. In 1956, the Rambler was sold through bothNash and Hudson networks of dealerships. This resulted from the merger of the two companies to form AMC in 1954. The new Rambler line created and defined a new market segment, the “compact car” as the automobile classification was called at that time. A V8 engine powered model, the Rambler V8, was added in 1957. The new for 1956 Rambler was arguably “the most important car American Motors ever built” in that it not only created and defined a new market segment, emphasized the virtues of compact design, but also enabled the automaker to prosper in the post-World War II marketplace that shifted from a seller’s to a buyer’s market. The sales war between Ford and Chevrolet conducted during 1953 and 1954 had left little business for the much smaller “independent” automakers trying to compete against the standard models offered by the domestic Big Three (General Motors, Ford, and Chrysler). The four-door Ramblers for the 1956 model year were completely redesigned, with a characteristic swept-back C-pillars (the Fashion Safety Arch), unusual wing windows on the rear doors, inboard, grille-mounted headlamps, as well as “the widest windshield” of any car. The short-wheelbase two-door (Nash Rambler) versions were no longer available. The new line retained the 108-inch (2,743 mm) wheelbase that was used for the previous four-door versions of the Nash Rambler, but the overall length was increased by 5 inches (127 mm), to 191.14 in (4,855 mm). The Rambler was substantially smaller outside compared to the other popular domestic cars of the era, but its interior room was equal to the top-selling “low-priced” field. Construction was also unusual, being unit body (what Nash called Double Safe Single Unit). The 1956 Rambler models were marketed under both the Nash and Hudson brand names. The cars were almost identical except for minor badge engineeringthat included different logos on the hubcaps, grille insert, and hood emblem. The new Ramblers came only as four-door models. Along with the usual four-door sedan and station wagon was a new four-door hardtop sedan. Rambler also introduced the industry’s first four-door hardtop station wagon in 1956. The station wagons used the same rear doors as the sedans with the back roof dipped lower over the cargo area and featured a standard roof rack. The wagon models were called Cross Country. An innovation for station wagons was Rambler’s roll-down tailgate window; competitors’ models used upward-hinged windows. The new car was described as “distinct and different …. can be recognized at any angle from its wide-open competition- type grille to the pronounced arch over rear window.” According to automobile journalist Floyd Clymer, “economy and high-performance do not go hand in hand, but in the Rambler, the owner will find a happy medium … though smaller, is safer than many cars. The welded, unitized body-frame construction offers above-average protection in collisions.” The single-unit construction that was used by AMC on all of its models provided a marketing advantage by offering buyers a $25,000 personal automobile injury insurance policy at no extra cost. The Typhoon straight-six for the new Rambler was based on the previous 195.6 cu in (3.2 L) block, but was improved and featured overhead valves and produced 120 bhp (89 kW; 122 PS). 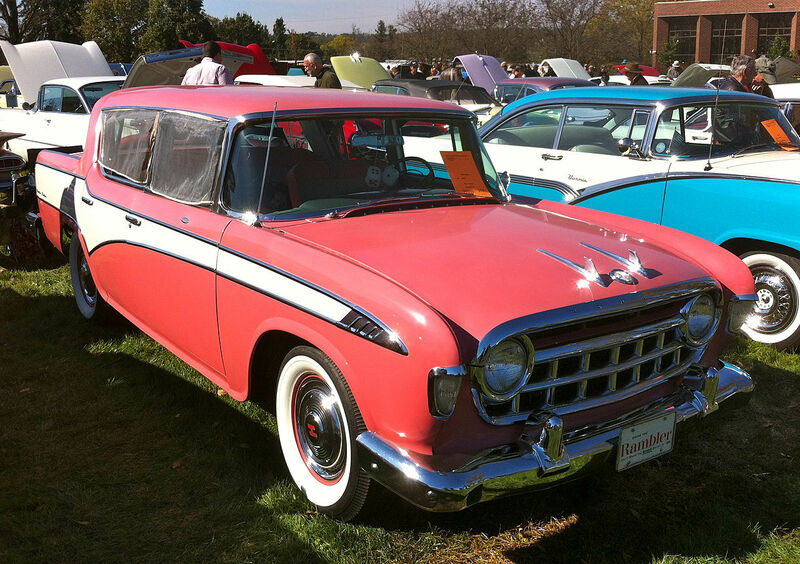 It was the only engine available in the 1956 Rambler because the automaker was still developing its own V8. This engine was said to deliver 33% more power than the 1955 version, and – at up to 30 miles per US gallon (7.8 L/100 km; 36 mpg-imp) – provided better fuel economy than the competition. The new Rambler also changed to a 12-volt electrical system. The automatic transmission was the GM-produced Hydramatic (called Flashaway by AMC). A torque tube drive system was used with a four-wheel coil spring suspension instead of the previous Hotchkiss drive setup. The interiors were offered in fifteen colors, and offered “genuine leather” (in six colors) as an option. The station wagons were popular with buyers, and in addition to power brakes (standard on Custom models), frequently ordered options included power steering, two- and three-tone exterior color schemes, a continental tire, Weather Eye heating and air conditioning system, as well as dealer accessory window insect screens to use with the individually adjustable and reclining front seats that could be used as a bed. The new Rambler model became the replacement for the large-sized Nash and Hudson “legacy” models that were now suffering from dwindling sales. On the other hand, the Rambler was the only completely new “popular-priced” car in 1956. Consumer reaction to the 1956 Rambler was very positive. Advertising for the new car urged potential buyers to “Drive the Rambler – You’ll Make the Smart Switch for 1956.” Almost 74 percent of surveyed Rambler owners by Popular Mechanics described their cars as small and roomy, as well as easy to park and operate. Sales for the inaugural year totaled 66,573. Of these, 20,496 were badged as Hudsons. Soon, the all-new “compact-sized” (as vehicles were defined at that time) models experienced a “sales explosion”. In 1957, the Rambler was established as a separate marque and these models became the foundation for the new company’s best sales performance through the late 1950s. Sales increased to 82,000. The four-door sedans and station wagons were offered as well as a four-door hardtop body style with no “B” pillar. The most basic trim level, Deluxe, was essentially for fleet customers and only available with the I6 engine. The Super and Custom trimmed models came with the I6 or AMC’s new V8 engine. The Deluxe had no exterior side trim or series name, the Super came with a single full-length body side molding and a “Super” script emblem, and the Custom featured dual full body side moldings with a “Custom” script emblem and a round “R” medallion on the top of the front fenders. The new Rambler Cross Country was “typical of the stylish, yet highly practical wagons built by AMC in the 1950s” and was offered in solid colors or two- or three-tone paint schemes. Only a few station wagons “were available in 1957 with the very vogue hardtop configuration”, and Rambler’s Cross Country station wagon in Custom trim carried a relatively low price of $2,715. Options included seat belts, padded dash, and child proof door locks. This was the first year the Rambler offered a new 250 cu in (4.1 L) V8 engine, producing 190 bhp (142 kW; 193 PS). A companion model in four-door hardtop style and featuring AMC’s new high-performance 327 cu in (5.4 L) V8 was also introduced in 1957. This was the Rambler Rebel and it was an early “muscle car.” With overdrive, the 1957 model was capable of up to 32 mpg-US (38 mpg-imp; 7.4 L/100 km). George W. Romney stated “the Hudson and Nash would remain distinctive in size from the Rambler in 1958.” Designs were developed for the big-car Hudson and Nash models to share the Rambler automobile platform by stretching the body about nine inches ahead of the cowl. However, the Rambler become the new AMC division following the discontinuation of both the Nash and Hudson lines after the 1957 model year. The larger-sized 1958 Ramblers incorporated “more than 100 changes and were outwardly quite different from their predecessors.” The cars received “a complete reskin that made the 1956 bodies look a bit bulkier”. This major redesign featured new front and rear fenders. A new front end moved the headlamps from inside the grille to the top of the front fenders and featured twin headlamps on each side on the “Super” and “Custom” models, as well as full-length bodyside moldings. The basic “Deluxe” trim models had no side trim and came standard with single headlights, but the new “quad” headlights were optional. The Rambler models continued to be the shortest cars in the U.S. – at 191 inches (4,851 mm) in total length – with room for six-passengers. Rambler’s marketing focused on having “the best of both: 1. American big car room and comfort. 2. European small car economy and handling ease.” Powering the Rambler Six was AMC’s new 127 hp (95 kW; 129 PS) overhead valve (OHV) 195.6 cu in (3.2 L) straight-six. 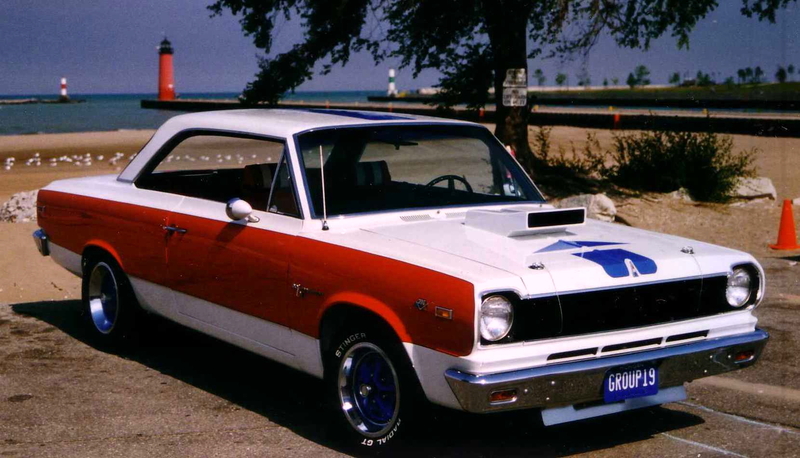 NASCAR tests showed the Rambler Six had a $0.01 per mile gasoline cost when equipped with overdrive transmission. A V8 engine was available in the Rambler Rebel models. A Borg-Warner torque converter “Flash-O-Matic” automatic transmission, with the “then-trendy pushbutton” gear selection on the far left side of the instrument panel, was optional. Also new on the left side for the driver was a step-on parking brake pedal. Sales of the Rambler six and V8 increased to 119,000 during a year when all U.S. cars were down in volume. The 1958 Ramblers “sold like hotcakes” and returned the smallest U.S. automaker to profitability. Together with the smaller Rambler American line, AMC “broke sales records” in 1958 as consumers valued basic transportation from their automobiles and no longer cared “how big their cars were.” Although in the midst of the Recession of 1958, Rambler captured seventh place in automobile sales. Improvements to the Rambler included new side trim with a full-width die-cast grille, as well as thicker brake linings and larger brakes for V8-powered cars. Engineering changes included fuel economy improvements with lower axle ratios and more efficient carburetor for the I6 engines. An electrically engaged overdrive unit behind the three-speed manual transmission was also available. To increase longevity, Rambler mufflers were aluminum-coated on the inside and zinc-coated on the outside. On cars with automatic transmission, engine starting was now incorporated into the neutral pushbutton, thus eliminating the ignition key start switch. Accidental starter engagement was prevented by a lockout when the engine was running. A total of 11 models were offered for 1959, all four-door versions of sedans, station wagons, and Country Club hardtop (no B-pillar) body styles. Premium options and conveniences continued to be offered including “Weather Eye” air-conditioning, air suspension on V8s, limited slip differentials, an exterior mounted continental tire, as well as the American Motors’ exclusive individually adjustable and reclining front seats with headrests. Sales of the Rambler Six and V8 continued to increase. The 1960 models featured numerous exterior and interior design changes. The greenhouse was made “lighter” with a narrower C-pillar and roof profile, as well as slanting both the windshield and rear window at a greater angle providing for an “airy cabin.” The front end was simplified, while the tailfins became smaller thus highlighting the new tall taillamps. The overall length was trimmed by 1.6 inches (41 mm) because of a new spit-bumper design. Riding on 15-inch wheels the Rambler appeared to be larger than it actually was. The interior was also revised and the instrument panel now incorporated all instrumentation within a large oval in front of the driver. 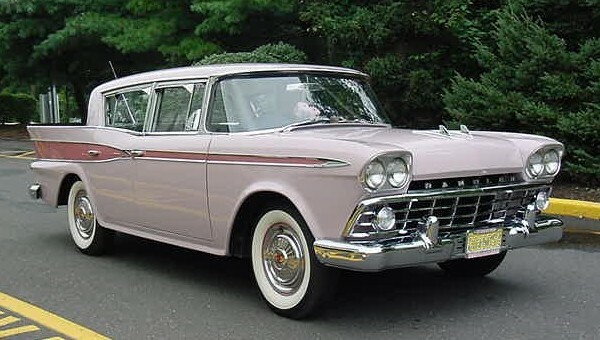 In 1960, the Rambler line reached third place in total annual industry sales in the United States. The 1960 Rambler Six with its 127 hp (95 kW; 129 PS) 195.6 cu in (3.2 L) engine became the best selling model for AMC with 297,368 sold for the year. American Motors established agreement with French automaker Renault to assemble Ramblers from CKD (Completely Knocked Down) kits in the Vilvoorde Renault Factory in Haren, Belgium. The cars were sold and serviced through Renault dealers in Algeria, Austria, Belgium, France, the Netherlands, and Luxembourg. The Rambler was sold as an “executive car” in these markets. Midsize Rambler models were assembled in Mexico during two different periods, the first under Armadora Mexicana based in Mexico City between 1956 and 1957, and the second under Planta REO based in Monterrey, between 1958 and 1959. Due to low sales volume, American Motors terminated its contract with Armadora Mexicana that dated back to 1950, Rambler models were again imported from the United States (between 1957 and 1958), sold through a limited network of dealerships of which most were located in Mexico City, until the agreement with Planta REO was formalized. The problem of low sales continued under Planta REO and AMC cancelled the contract. Importation of AMC vehicles into Mexico resumed until a third domestic production partner was established. Willys Mexicana, the company what would become Vehículos Automotores Mexicanos (VAM) was the third local company that AMC would sign an agreement in 1960, but VAM did not assemble the Rambler Six and Rambler V8 models.